This begins our 13th trip through a region of Europe and we have run out of places to go. This time we decided to finally visit Greece, which we have never seen except for the 2009 Italian cruise stop on the island of Corfu. Our IOL Power Club had set up a special meeting in Athens which coincided nicely. 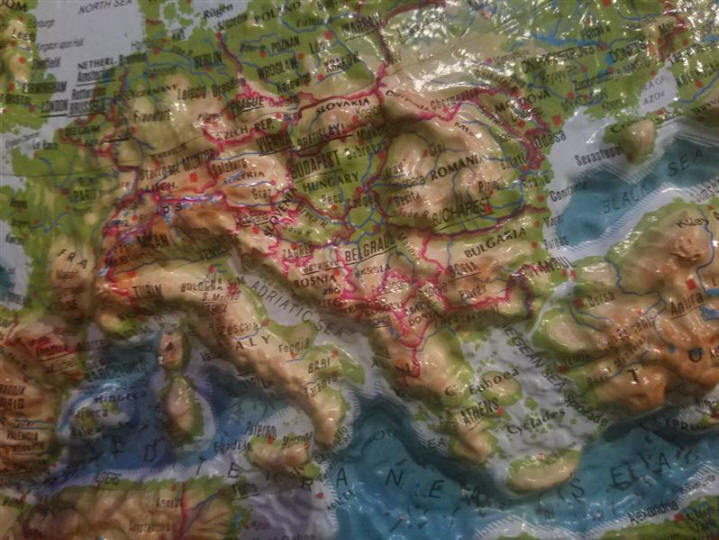 We combined this with a week in Vienna as tourists, a week day-boating around the shore towns on Lago di Garda in Italy and stopovers in Sofia, Bulgaria, Belgrade, Serbia and Zagreb, Croatia. Since I have reported on our trips to Boston several times in the past, I will keep this twelve days before the flight as short as I can. 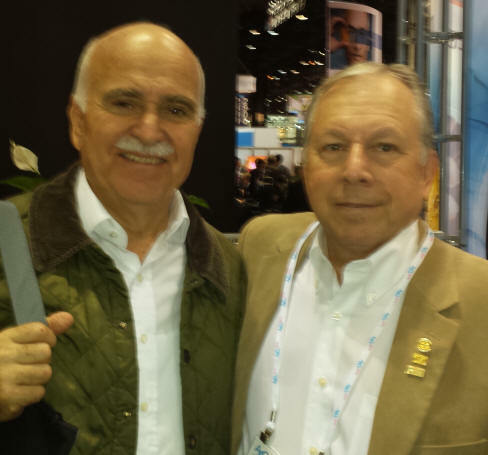 As a prelude, I had hoped that my colleague from Greece, the famous Dr. Iannis Pallikaris (below left), would help me with advice and recommendations regarding this trip and especially how to book a cruise to the Greek Isles. To my great disappointment, he was of absolutely no help at all. 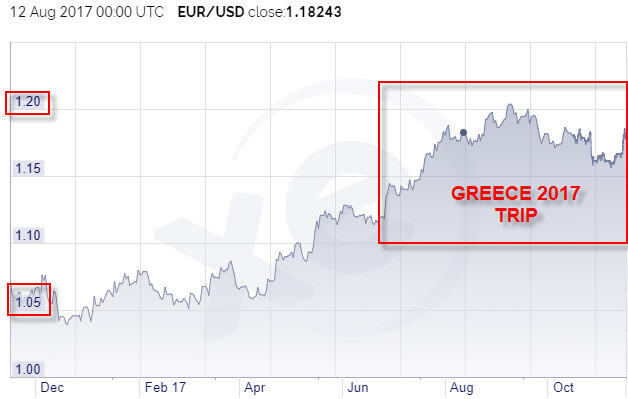 The ongoing frustration for us over these past twenty years has been the value of our dollars when travelling in the EU (above right). 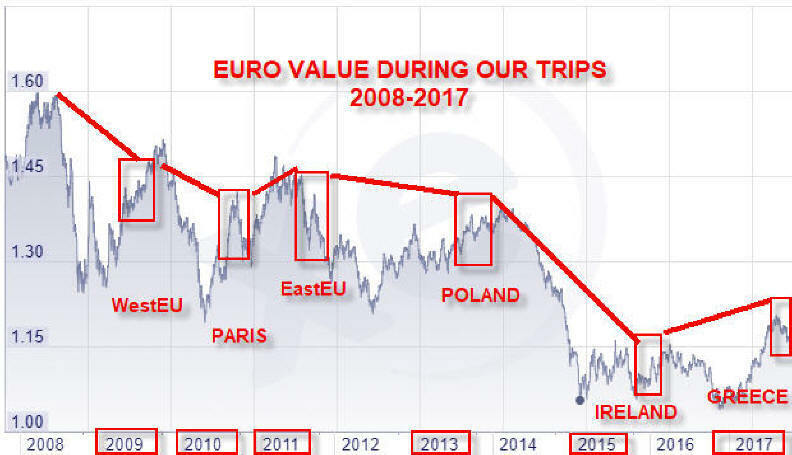 As can be seen from this graph, the Euro always gained in value in the summer just before we left after having been lower during the preceding months. From year to year, it gradually decreased and took a deep dip in 2015 but since we were mainly in the UK a lot, the British pound did not drop. Of course, it went directly back up for this trip. And, as can be seen in this graph (below), it did nothing but climb in value from the beginning of the trip to about half way through when it gradually receded - it reached it's peak in the middle of the trip. Because my Palm phone and Calendar have been relegated to my technology history collection, the Diarios here are based on the information I collected on my Samsung Galaxy S7 Edge phone to my Google Calendar. This was much more cumbersome since it does not readily allow all data transfers. What is also different is that I used the S7 phone for a lot of the photos. Marcia had flown to Boston on Saturday, June 24th so she could visit with her brother for a few days on Cape Cod before I get there. I was having trouble with my printer so, at the last minute, I had to drive over to Printland and wait while they printed off forty agenda programs for our IOL Power Club Meeting in Athens. After I did my run, Clara drove me to the LA Union Station downtown and we got there at 6:05 PM and I rolled my bags to the First Class lounge on the second floor. 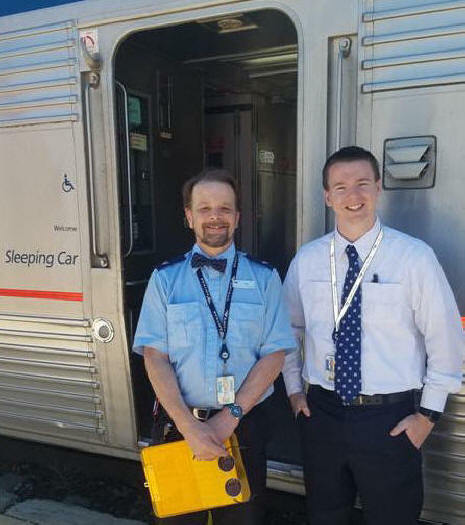 My redcap, James, took me and all my bags on his cart right up to my Southwest Chief car and then Paul, my car attendant, carried them up to my room. Train 4 departed at 6:15 PM, on time. I was in Car 431 in Deluxe Bedroom B. 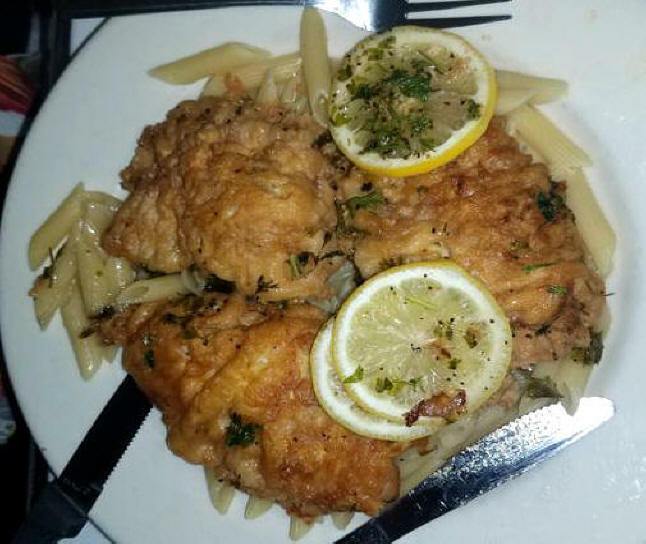 At 8:00 PM, I went for dinner in the dining car and had a Bud Lite then roast chicken fettuccini carbonara with succotash followed by a lemon tart. I worked on my computer in the lounge and then tucked in at a reasonable time (for me). I was awakened by a phone call at 8:00 AM and went back to sleep. 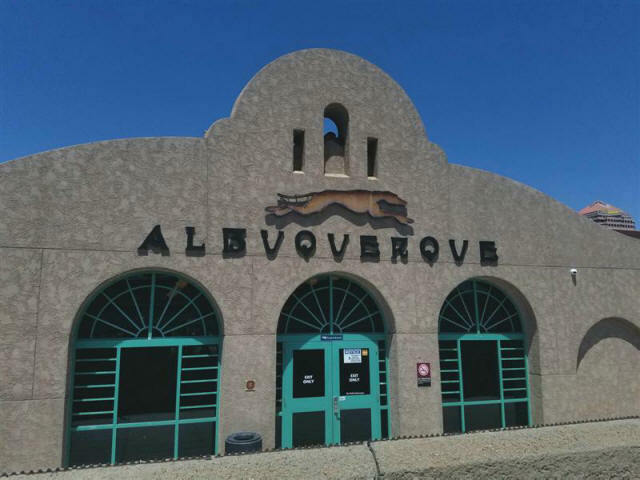 I had a beautiful night's sleep and Paul woke me a half hour before we arrived into Albuquerque station at 11:22 AM (twenty minutes early), for their extensive refueling and resupplying. 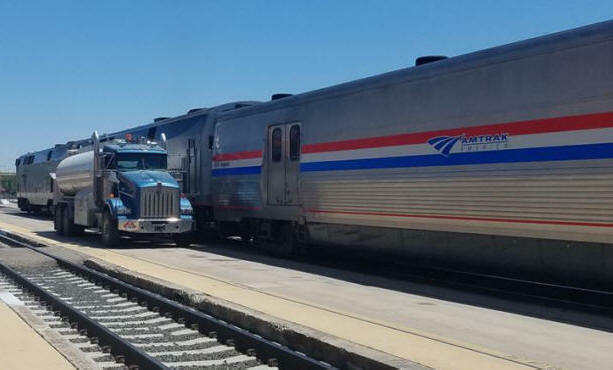 Below left is looking east toward the engine (being refueled) and on the right is looking west at the double-deck cars. My car is way down at the end near the bridge. This time I got some photos of where I do my run here in the hot sun and high altitude (5,312 ft; 1619 m), more than a mile up. And, you can really feel it when you're running. 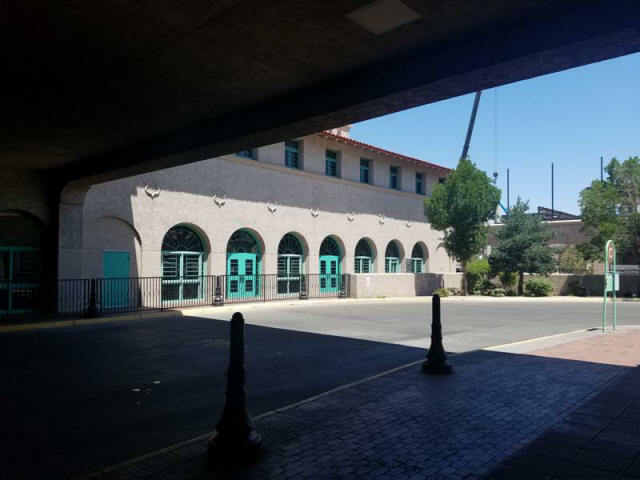 At 11:28 AM, I ran over to the Bus Depot section of the station (in 95º dry heat) where there is a covered waiting area and just run back and forth under the roof. Below is looking both ways from the midway point. It doesn't look it but it's all outside except for the covered roof. It takes about four to five circuits to make a mile. When I am finished, I always go past the bus station (below left) to the coffee shop located below right. Inside they have a nice room (below left) where I can fast walk for my remaining time in air conditioning. 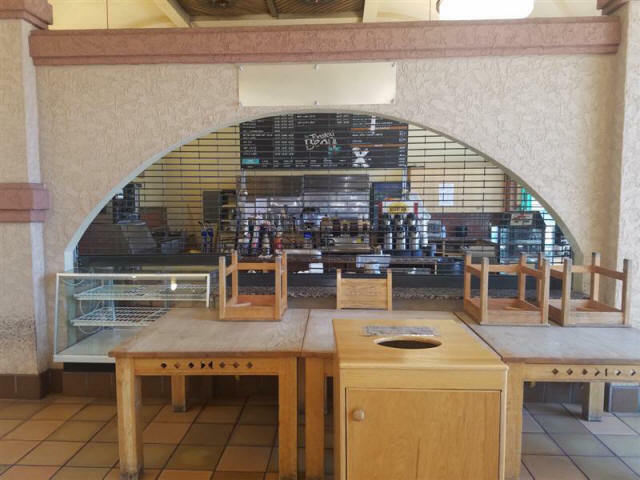 It is a shame the coffee shop went out of business and now just sits there empty (below right). 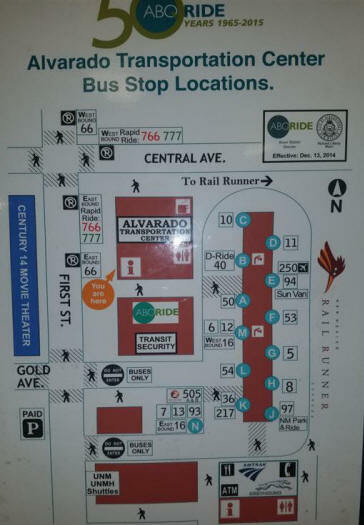 They call this whole complex the Alvarado Transportation Center. In their map (below left), the red upper left box is the room where the coffee shop was and the elongated red rectangle on the right is the covered area I run in. 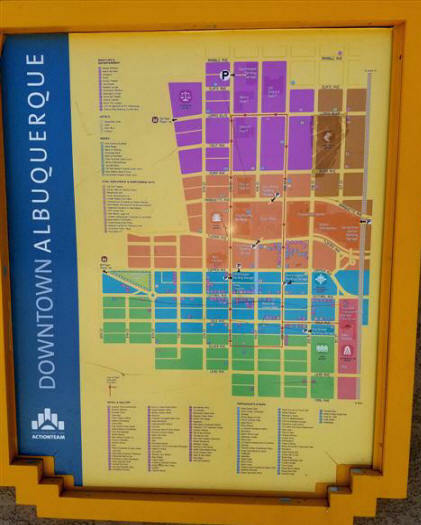 They have this large map detailing downtown Albuquerque. Sometimes, if the train comes in too early, I will fast walk around the city area but it's really not very interesting. Waiting for me when I am done is Paul, my car attendant (blue shirt) for the LA-CHI trip. I've had him for several trips in the past and he takes good care of me; letting me sleep and making sure I am up for my run. We pulled out on time at 12:10 PM. I worked on the computer in the lounge car until it was dinner time at 8:00 PM and I was done at 10:00 PM. Dinner cost me $11.50 because I had a glass of wine. I finally went to sleep. I woke at 4:10, 5:55 and again at 8:30 AM and then wound up staying up. We had stopped in Kansas City for awhile at 7:20 AM. We pulled into Chicago at 4:10 PM, almost an hour late. I got packed up and Jerry, my redcap, drove me into the terminal and to the new First Class lounge. 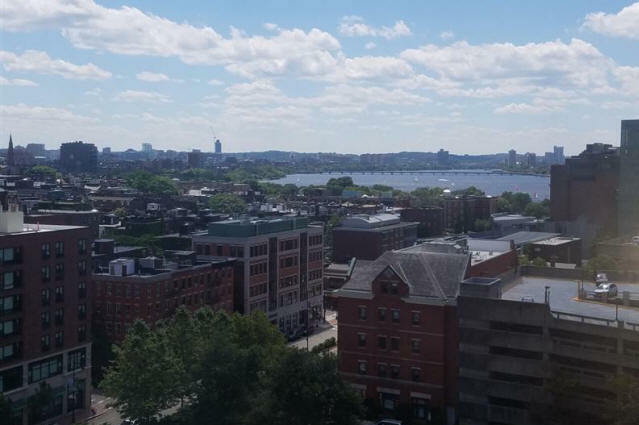 At 4:40 PM, I did my run in 75º fair weather four times around Boston Blackie's block. When I was done, at 5:10 PM, I went for a free cappuccino at Peets, because I just enrolled in their Android app. 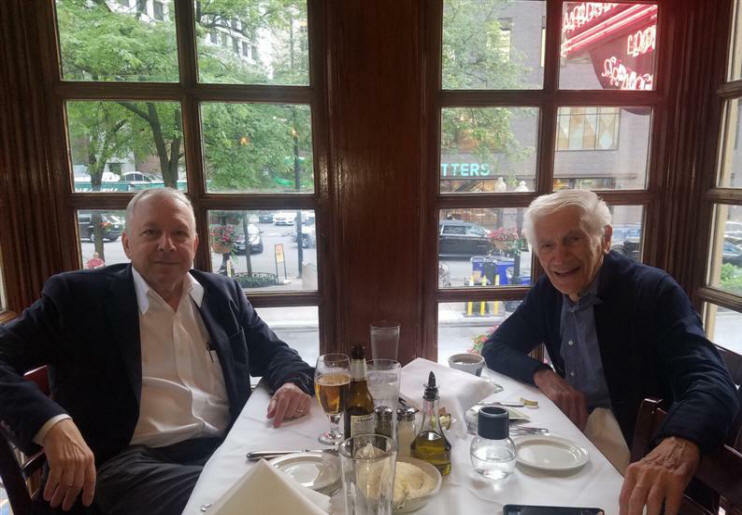 While on the train, I had called my colleague, Dr. Manus Kraff and planned dinner with him. 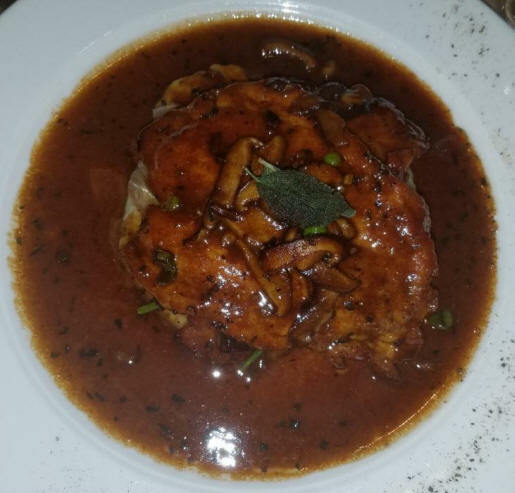 So, at 6:35 PM, I caught an Uber and Kristine drove me to Carmine's Italian [1043 N Rush Street, 312-988-7676], which I have shown before in these Diarios. Manus and I both like this place, even if the food isn't always the greatest, sometimes it is. 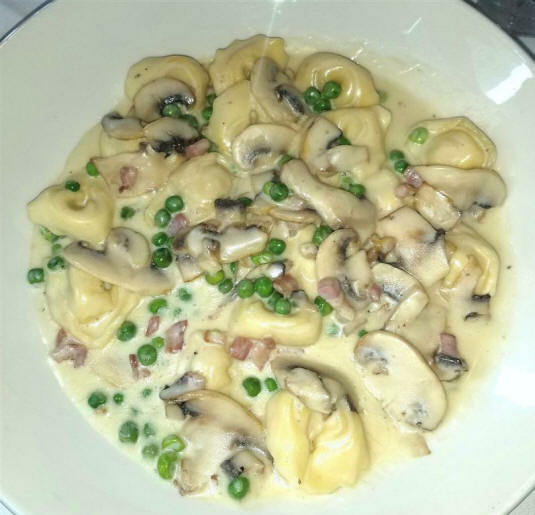 I enjoyed two Krombach Austrian pilsners and then had tortellini carbonara with prosciutto and peas (below right) which was pretty good. As it turns out our waiter, Niko, was from Bulgaria so I got some good advice about his country. We had a good time getting together and when we were done, I had some time to walk around Rush Street before catching another Uber at 8:35 PM and Raid got me back to the station for $9.78. I walked around in the station and stopped in a Faber Store and bought a few things for $7.66. I then got a take out cappuccino at the Corner Bakery Café [222 S. Riverside Plaza, 312-441-0821] for $4.19. 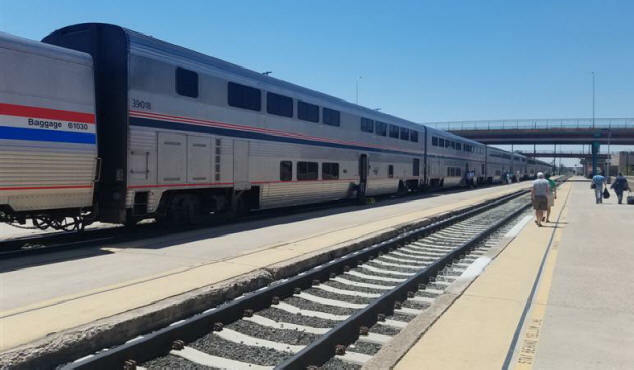 I walked back to the Lounge and then the redcap took me and my bags to Amtrak's Lake Shore Lmtd, Train #448 and to Car 4820 and my car attendant, Chris, put them into my Deluxe Bedroom A and I settled in. The train pulled out at 9:30 PM on time. I had already had my dinner, but the provisions I bought made a nice late night snack. I worked on the computer and finally went to bed. I woke at 9:30 AM and got up and I was all ready for my run when the train arrived in Albany, NY at 2:55 PM. At 3:03 PM, I did my run on the platform in 85º heat and finished it in my car because the train took off at 3:05 PM. Our attendant had moved our bags to the Boston half of the combined train but I wound up losing my sleeper room and was put in First Class Coach which is about the same as "No Class" Coach for the rest of the trip to Boston. I got a coffee and worked on my computer for five hours. I arrived in Boston South Station at 8:10 PM, ten minutes late. I immediately rolled my bags into the station and right up to the Auntie Anne's Pretzels stand and bought my usual two regular pretzels for $3.65. I rolled my bags out to the taxi queue and at 8:33 took another Uber and George drove me right to the hotel in 9 minutes for $3.93. 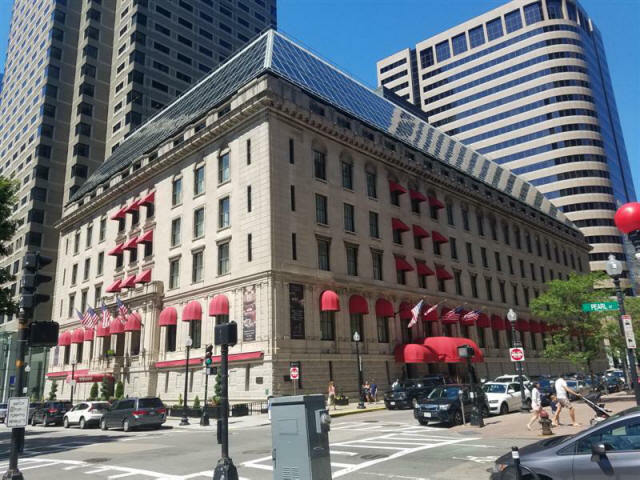 I checked into the Hilton Boston Downtown/Faneuil Hall Hotel (below) [89 Broad Street, 617-556-0006], and went up to room #837. Marcia was already there waiting for me and since it was getting late, I unpacked a little and we headed downstairs. 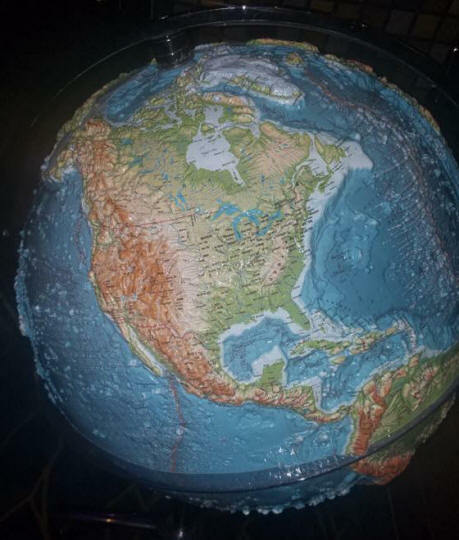 In their lobby they had this detailed relief globe showing all the mountain elevations (below). 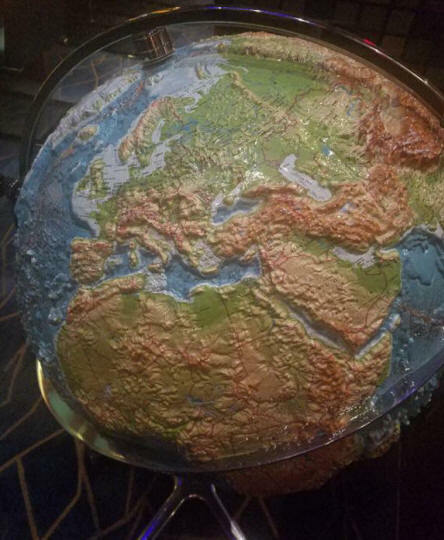 I got this close up shot of it (below right) showing Greece and Bulgaria. 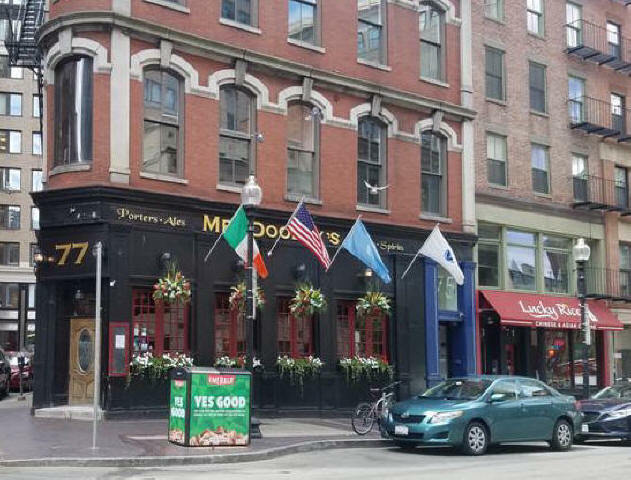 We headed out and walked to my favorite bar, Black Rose Pub, and at 9:00 PM, I had a pint of Smithwick's Ale and Marcia had a glass of white wine. After I had another half pint, I paid the bill ($26) and we headed out. 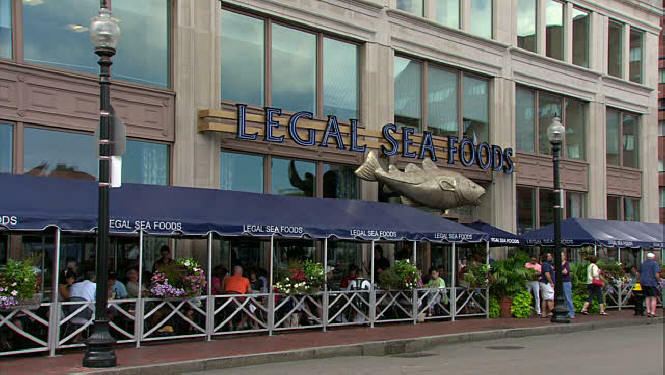 By 9:45 PM we got to Legal Seafood Long Wharf [255 State St, 617-742-5300] (stock photo below right). 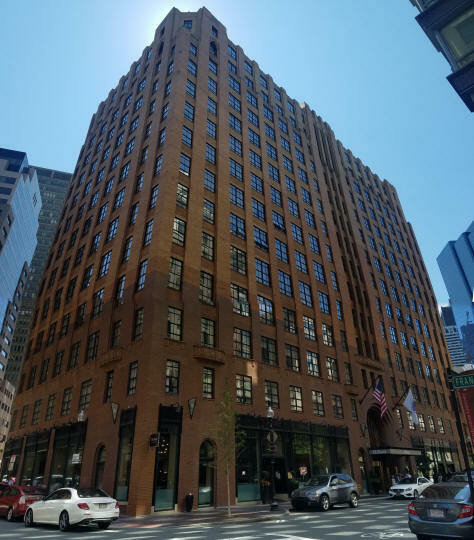 It's on the ground floor of this large office building on State Street. We ordered a beer and wine and relaxed while we ordered (stock photos). 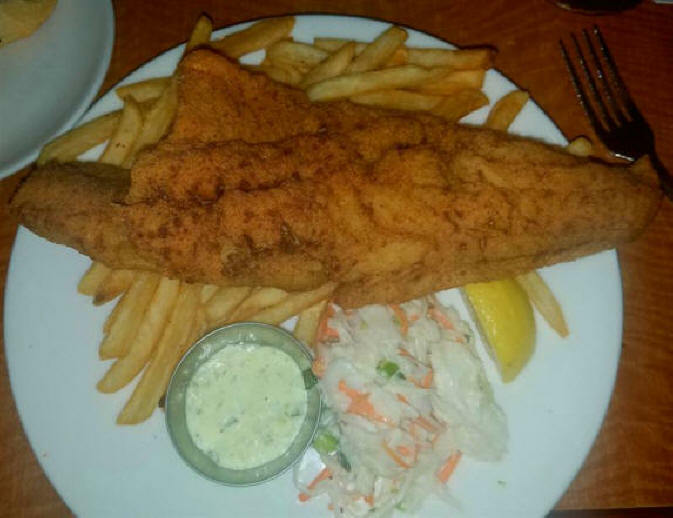 I then had an appetizer of fried haddock c fries and cole slaw (below left). 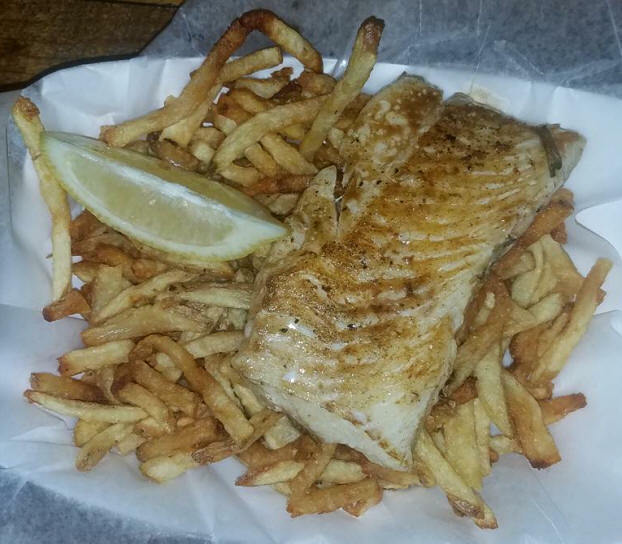 I told our waiter, Joshua, that the haddock was disappointing and he brought me an another one with fresh onion strings and fries. 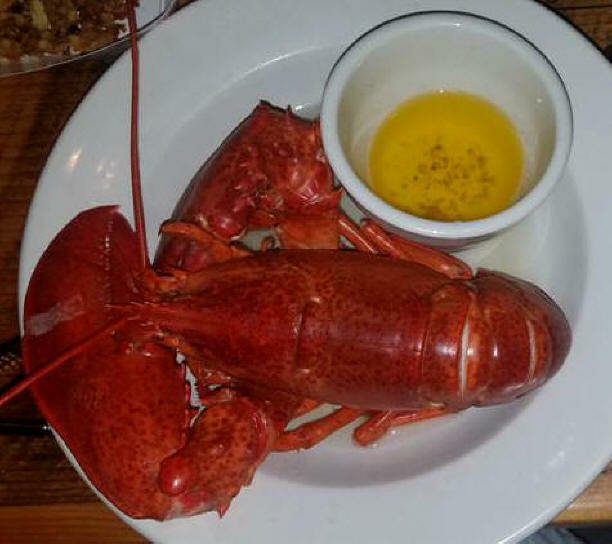 Then I had a dinner of a two pound lobster (stock photo) with onion strings and fries. Marcia had a starter of clam chowder and then for dinner she had a crab roll with sautéed spinach. Obviously I couldn't eat all the fries. The whole dinner cost us $121.00. 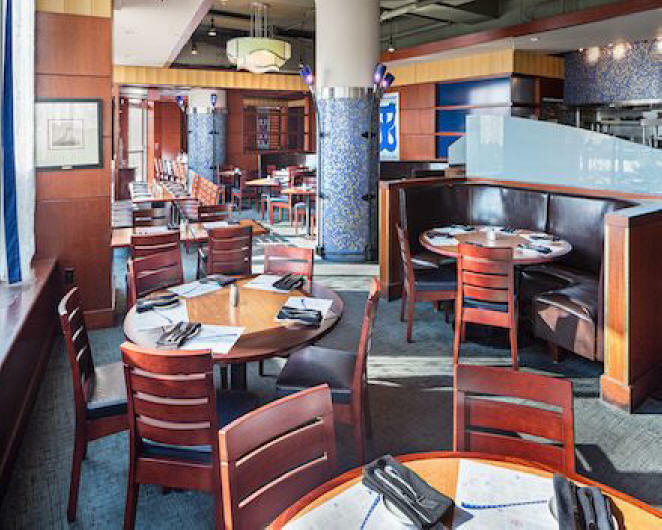 This is the second time this Legal Seafood has been disappointing. We walked back to the Hilton and got to bed at 1:10 AM. This is our second day in Boston. I awoke at 7:00, 9:00 and 11:10 AM and got up and into my running gear. 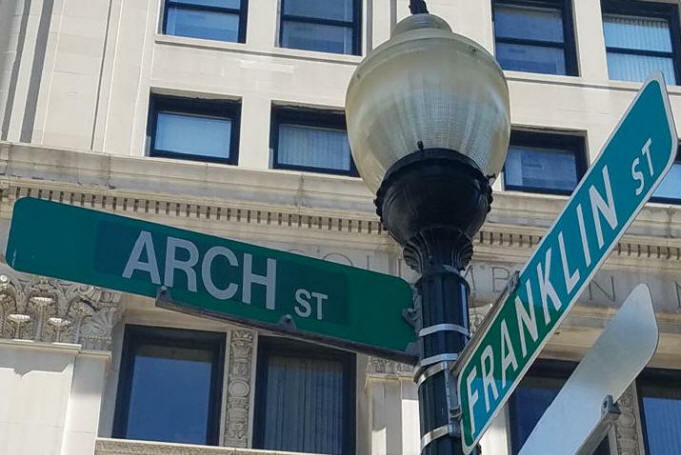 At 12 Noon on was on my run down Franklin St. to the intersection with Arch St. and it was 85º and humid. 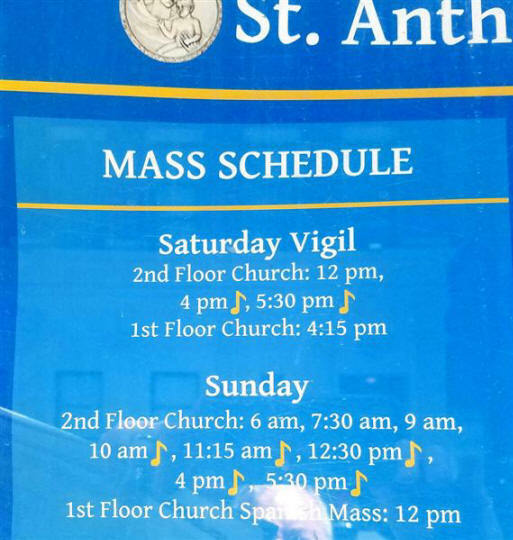 At 12:30, I attended Mass at the St. Anthony Shrine (below left) [100 Arch St.]. Here it is (below right) from Summer St. 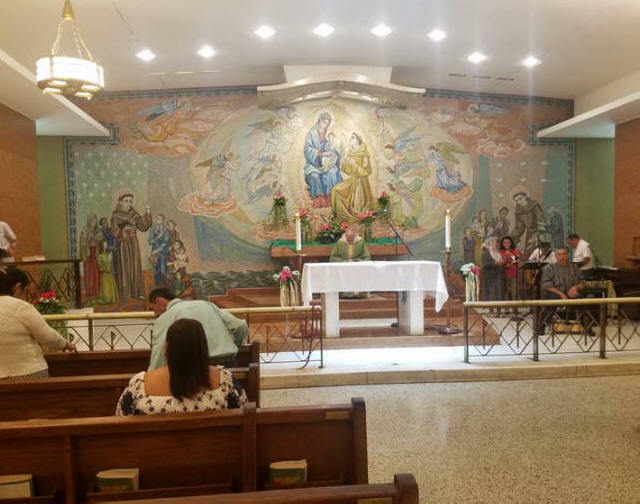 Here it is (below right) from Franklin St.
Below left is a closer shot of the altar. 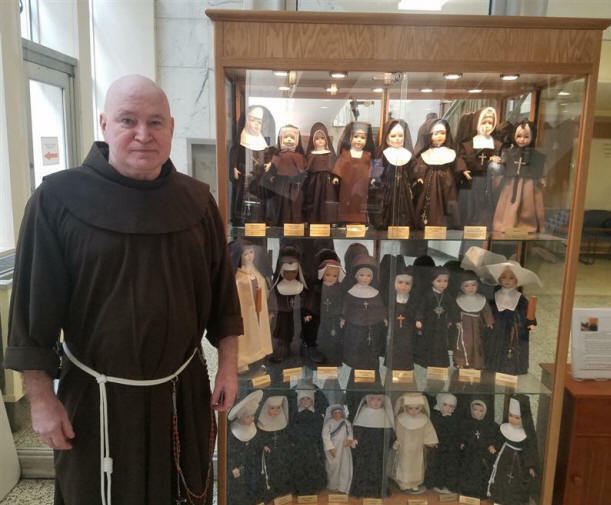 Below right is Franciscan Brother John standing next to the cabinet displaying his collection of dolls dressed in the various nun's habits of the Catholic Church. I've never seen anything like this anywhere; here he had 25 different Habits. Below are close ups of the three shelves. Perhaps some Catholics might recognize some of them and what order they go with. You can note Mother Theresa above center. I picked out the dolls representing the wonderful nuns who had such a great influence on my early education and on my life. A lot has been lost for society with the elimination of these habits. The doll on the left represents the Sisters of Charity that I had teach me in 7th and 8th grades at St. Mary's Elementary School in Troy, NY (which no longer exists). I remember most Sr. Florence in 8th grade. The doll in the center represents the Sisters of Mercy I had at Catholic Central High School in Troy. I remember Srs. Mercedes and Florentine. The doll on the right represents the Sisters of St. Joseph and memories of my excellent German teacher, Sr. Ambrose but most importantly, Sr. Jean Veronica (above right in 1985) who taught me both Chemistry and Physics, giving me an A+ in both and recommending me to Fr. 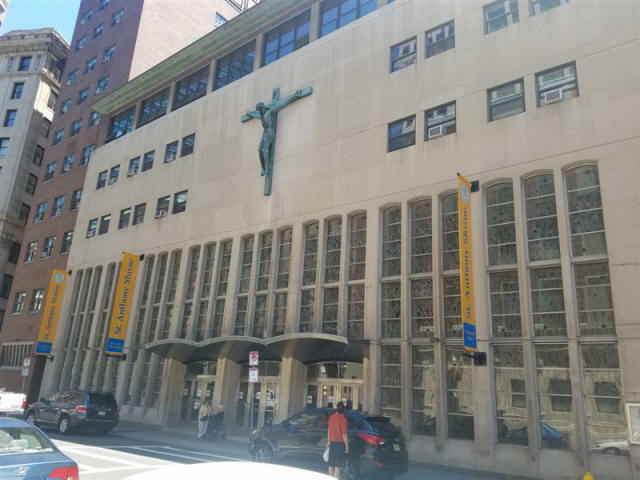 John Keefe (the Principal) to award me the four year Principal's Appointee full tuition scholarship to Siena College in Loudonville, NY which, of course, changed my entire life. I had no financial means to attend college. She died several years ago and I will always be grateful to her for what she did. She just loved these Diarios and I bought her a computer so that Sr. Anne could print them out for her. That scholarship disappeared many years ago because it used its principle for the awards instead of the interest. I have been working to reestablish this scholarship in the future such that it does not use the principle, but only the interest. 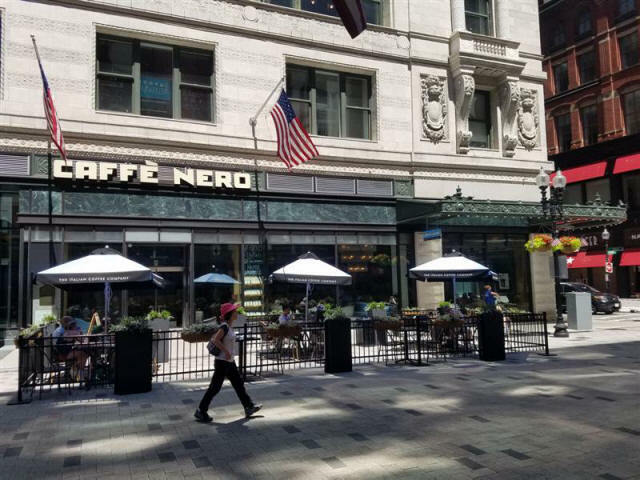 After I left St. Anthony's, at 1:00 PM I went and had a cappuccino at the nearby Café Nero [Burnham Bldg, 10 Summer St., 857-277-1888] which cost me $6. I've been here several times. 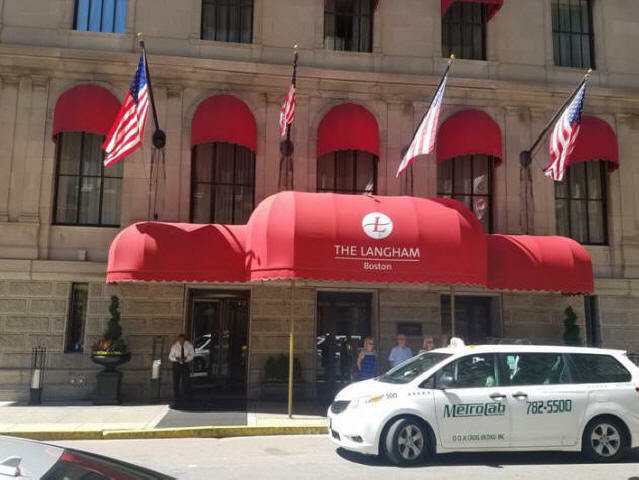 I left there at 2:15 PM and walked by the large Macy's store and then past the Langham Hotel where we stayed before and will again. It is an impressive building (below). I always like to get a photo of some of the interesting street art. 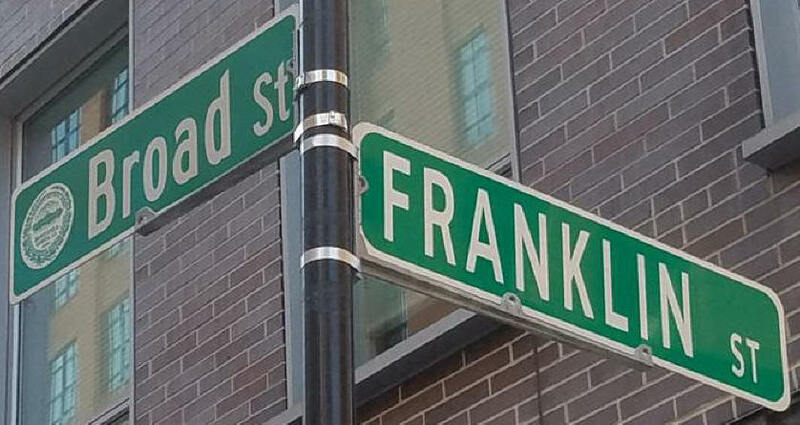 I went by Broad and Franklin on the way back to the hotel. I went by the building that replaced the Long Lane Meeting House. 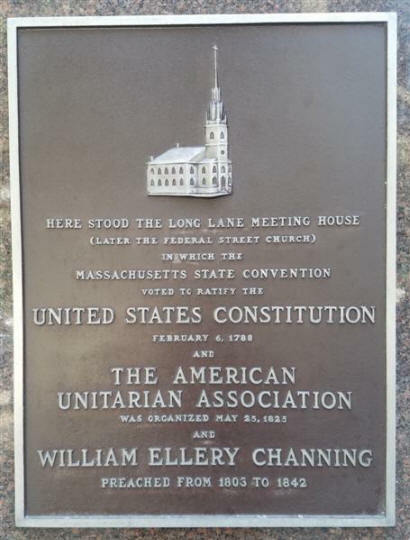 It was here where the Massachusetts State Convention voted to ratify the U.S. Constitution. 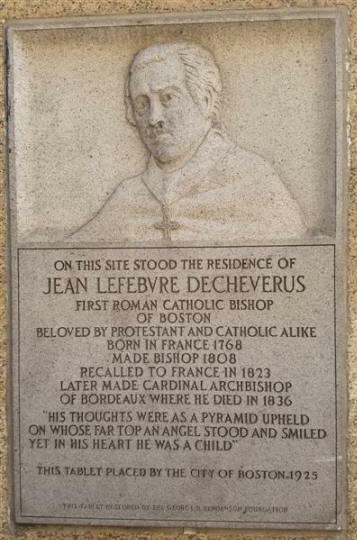 There was also a tribute to Bishop Jean-Louis Lefebvre de Cheverus (1768–1836), the French Bishop (below right) who was the first Roman Catholic Bishop of Boston (1808-1823). 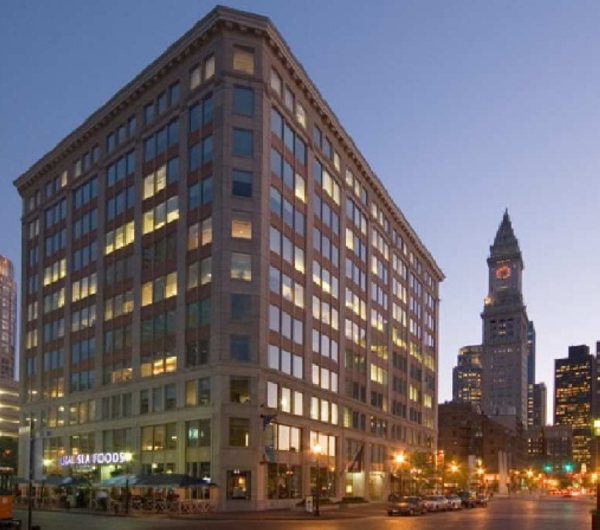 In 1816, Cheverus supported the establishment of the Provident Institution for Savings in Boston, the first chartered savings bank in the U.S. 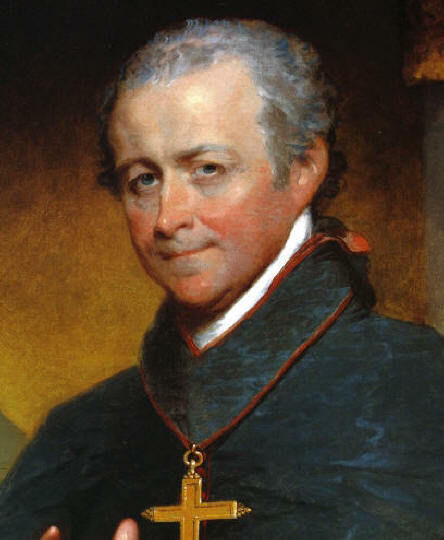 He later became the Bishop of Bordeaux, France and was later elevated to a Cardinal. I walked back to the Boston Harbor Hotel and at 3:00 PM I took a nap and slept until 6:30. I woke at about 8 and got dressed for dinner. 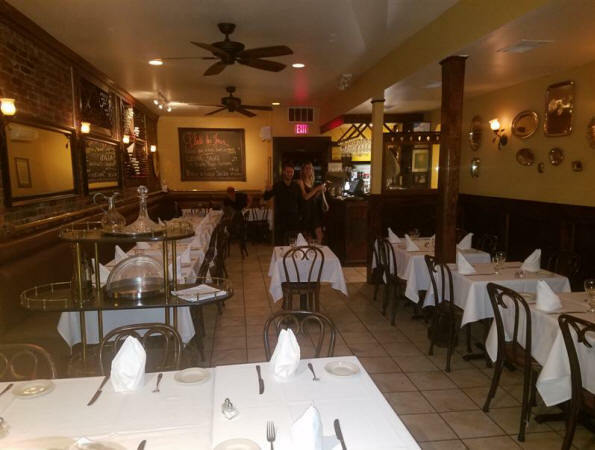 We decided to go back to our Italian restaurant we enjoyed last time, so we walked to it and at 8:40 PM had dinner at Antico Forno Cucina a Legno [93 Salem St., 617-723-6733]. We had to wait a bit to get a table, so we sat at the bar and I had a Peroni beer and Marcia a white wine. This lovely lady next to her struck up a fun conversation with Marcia and they were having a great time. She even offered us some of her pizza. I declined since I didn't want to fill up on bread. We were given a nice table in the front and I ordered a bottle of La Marca prossecco and then fettuccini c ham and cream as a Primi and Marcia had a Caprese salad. Both were very good. 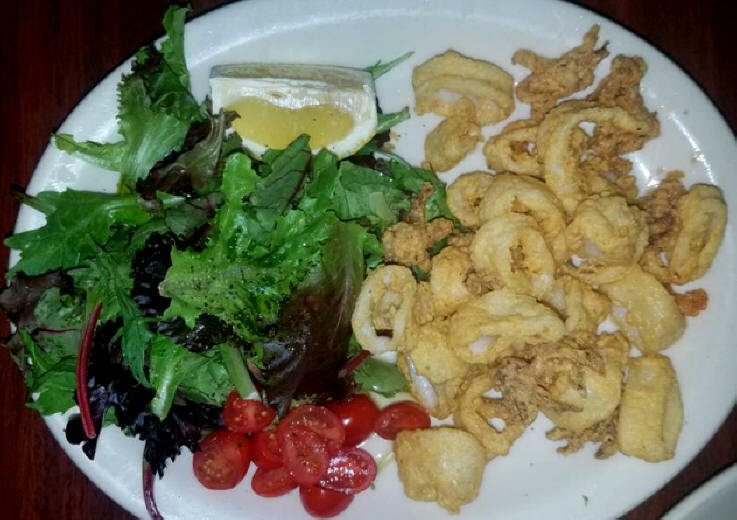 For our entrée, Marcia had calamari fritti with salad and I had my favorite, veal saltimbocca with potatoes. The whole meal cost us $120.00. Our waiter was Bulgarian and very nice. We walked back and I got these shots of this building being lit up in red, white and blue for the upcoming Fourth. 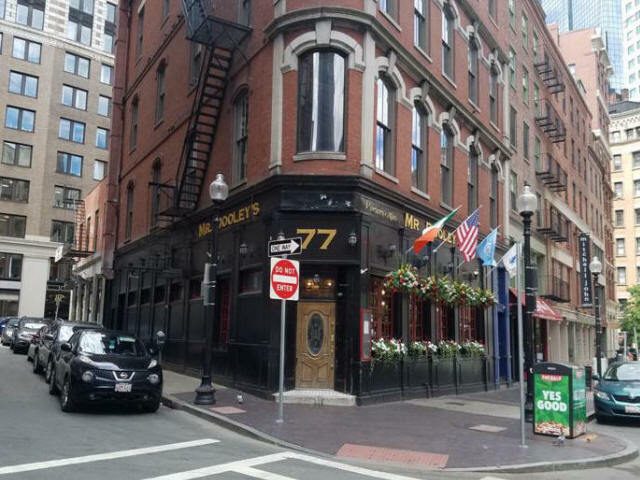 We wandered our way back to the hotel and bumped into Mr. Dooley's Pub [77 Broad St, 617-338-5656] and couldn't help but go in for an after dinner cocktail. At 11:15 PM, we ordered two Irish coffees for $24. We didn't stay long and then went to the CVS Pharmacy [218 Hanover St. 617-720-2688] at 11:31 PM to pick up a few things and then went back to the hotel and to bed at 12:30 AM. Today we drive from Boston to Rockland, Maine so I got up a little earlier and at 11:15 AM I did my run on their treadmill and then in the streets to the nearby 7/11 store where I stocked up on five bottles of Fresca for $11.25. At 12:15, I stopped into the Dunkin Donuts shop for a cappuccino for $3.73. I got back to the hotel, got dressed, packed up and checked out of the hotel. 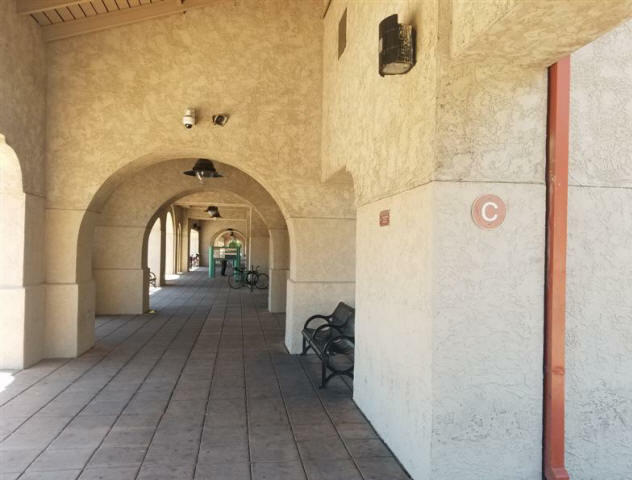 At 1:15 PM, I waited for the car and created the trip photo folders on the computer in their lobby. At 2:10 Marcia drove the first 85 miles to Rockland when, at 4:00 PM, we stopped at the usual pitstop, the Kennebunkport North Travel Plaza, which is quite nice. Here is the Budget rental car Marcia had picked up when she landed. It's pretty hard to pass up your first lobster roll at Linda Beans (above right) little cart outside, so we got just one to share. We went inside and I got a Starbucks cappuccino for the drive as well as my favorite Popeye's chicken wings. The Plaza heading north has this giant moose statue in the parking lot. 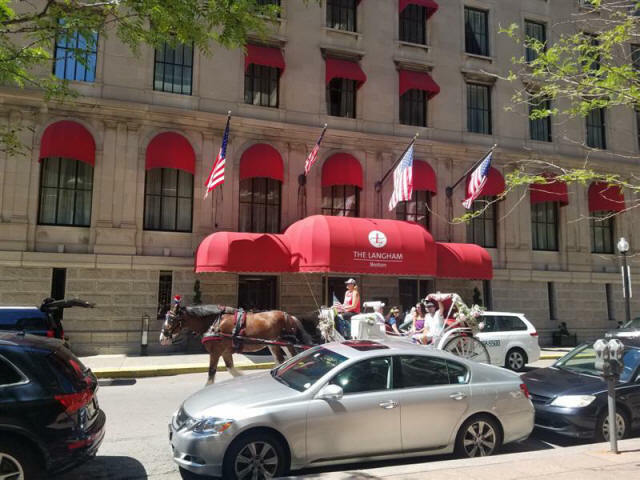 At 4:30 PM, I drove the next 50 miles to Bath, ME and 5:05 PM, Marcia drove the last 50 miles to Rockland and at 6:15 PM we checked into the Rockland Harbor Hotel [520 Main St, 207-594-2131] and got our bags unloaded. They gave us room #205. This is a pretty good place to stay and has a wonderful view of the harbor. 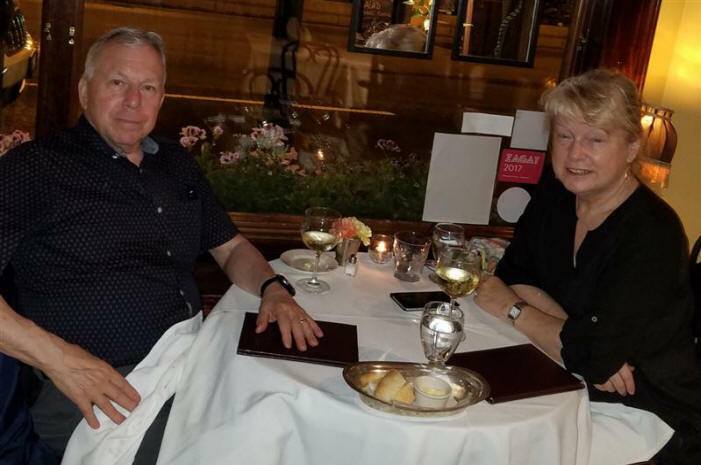 We got ourselves straightened out for the next four days and then decided for our first night to have dinner at Cafe Miranda [15 Oak St, 207-594-2034] which has the longest menu you will ever see. Click the link and see for yourself. It is very difficult deciding on what you want. We got a table at 8:00 PM. We had called Marcia's nephew Matt to join us for dinner and he likes selfies. We ordered quite a layout along with a bottle of Falingina Italian white wine. I started with a piece of sautéed haddock followed by an a lobster tagliatelle with some smelly cheese on it (below left) which ruined it for me. Marcia had their famous fried chicken with mashed potatoes and broccoli which she loved. Dessert was a gingerbread with whipped cream for Marcia and an affogata (espress and ice cream) for me. The whole dinner for the three of us came to $108, which is not bad at all. We walked back to the hotel and Marcia went to bed while Matt and I chatted outside in the patio for over an hour. I got to bed at around 1 AM. ... the view I had as I headed down Rockland's Main Street toward the center of the city. 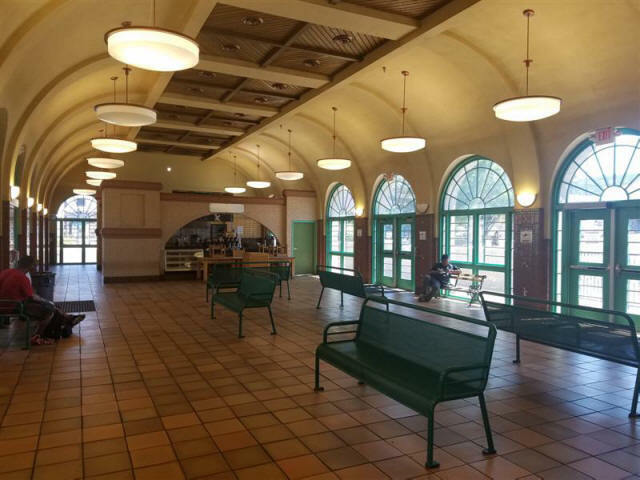 Here is a shot of the hotel's reception desk (left) and the breakfast room with large TV. Below is the entry (left) and the patio area with fire pit to the left where Matt and I chatted last night. As I got into town I noted a few signs. 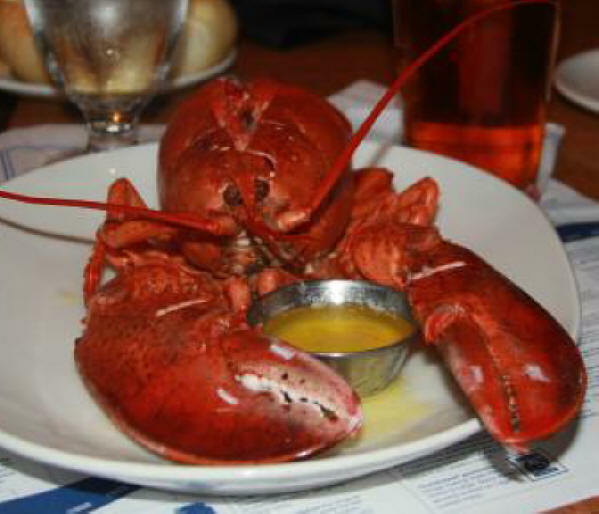 Unfortunately we will miss the 70th Maine Lobster Festival August 2-6. The new Strand movie theater is presenting the Harry Potter Film Fest. The Camden National Bank office is displaying a historic timeline of Rockland. 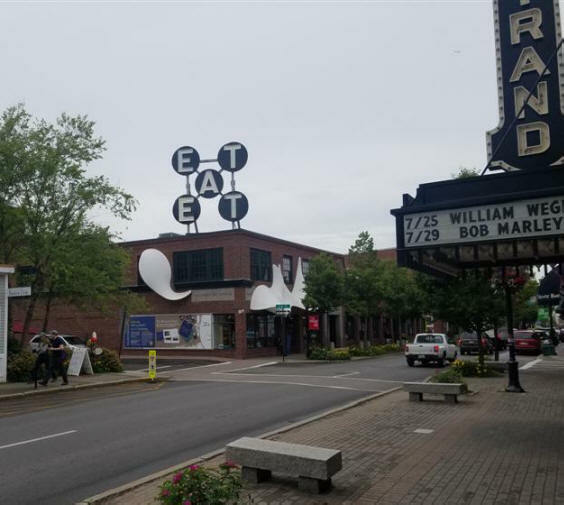 I went by the Farnsworth Art Museum on Main St with it's classic "EAT" art on it by Mr. India. I went past Melanie's In Good Company restaurant (left) and I was surprised to see that the Black Bull Pub is now called the Rock Harbor Pub and Brewery (right). I finished my run and it was time for a cappuccino in my favorite coffee shop, Rock City Roasters. I left there and got back to the hotel just in time to see the sun setting over the harbor. I changed and we went back to the Rock Harbor Pub [416 Main St, 207-593-7488] for dinner at 8:30 PM since most other places were closed for the holiday. Not very exciting for a 4th of July. I had a Guinness followed by sautéed haddock on linguini (they called a Haddock Rockefeller which is topped with bacon, Sambuca infused spinach and Parmesan baked to perfection served with garlic butter linguine and balsamic tossed greens) while Marcia had a couple of white wines with a cheeseburger and fries (they called a Rock Harbor Bleu Burger topped with bacon, bleu cheese crumbles and tomatoes on focaccia bread). I ordered a lobster roll to go and the whole bill came to $79. None of it was memorable. We finished up and went back to the hotel at 9:30 PM. I got on the computer and worked on the IOL Power Club meeting program for the ship portion of the meeting, ate the lobster roll and got to bed at Midnight. This was a dead day. I got up earlier today and at 1:30 PM, did my run to the end of town heading for the hotel I am hoping to put everyone up at for during the 2020 meeting of the IOL Power Club. It is called the 250 Main Hotel [ 207-594-5994]. Conveniently, there is a Rock City coffee shop right next door since the hotel has no restaurant. It was a relatively upscale place but after meeting the hotel coordinator at 2:10 PM, I discovered they do not have any meeting rooms to have our meeting. How disappointing. I have to find another hotel or use this place to sleep and find a place to have our meetings. She recommended alternatives but was not very friendly really. 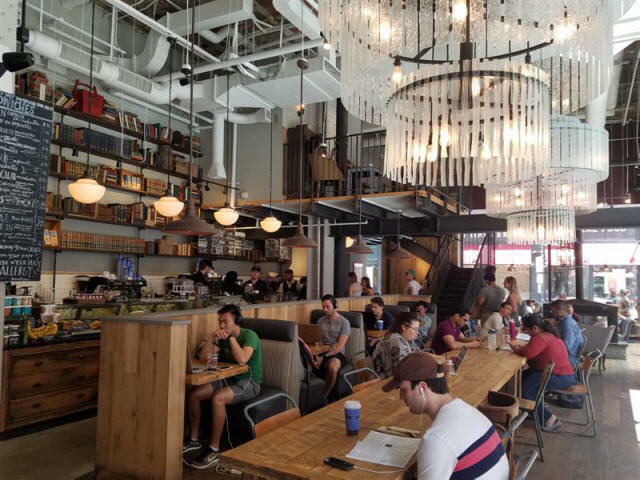 Here is the coffee shop. As I walked back, I got this wide shot of the harbor area where they hold the lobster festival. You can see the restaurants set out on the pier. 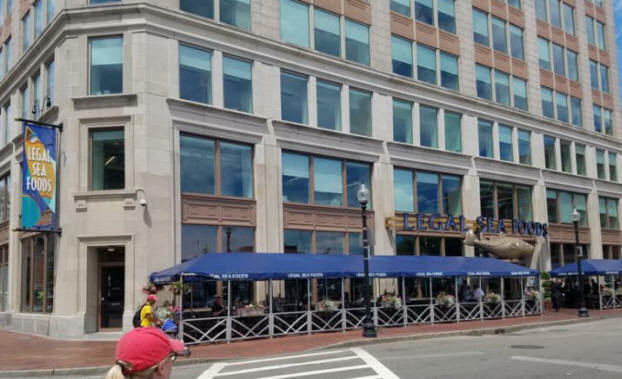 The lady at the hotel had told me try out the Maine Lighthouse Museum [1 Park Dr, 207-594-3301] (below) to see if they had a place for our meeting. It was only two blocks away, so I made a right on Park Dr. to find out if this was a possibility. At 2:40 PM, I went inside and it seemed pretty nice. I met Susie (below right), the lady in charge and she told me they did have a room we could rent for the meeting (at $100/day) and showed it to me (below). They can set it up classroom style (table below right) if we needed and they even have a side kitchen for coffee, etc. She even showed me their board room where the IPC Executive Committee could hold their meeting. Right across the street is the Tradewinds Hotel [2 Park Dr, 207-596-6661] which is a possible place to have people stay. After I left, I took this shot of the harbor behind the Museum. We were given a table at 8:30 PM on the second floor in the bar area. I started with a Peroni beer and ordered a bottle of Spanish Cava (champagne). 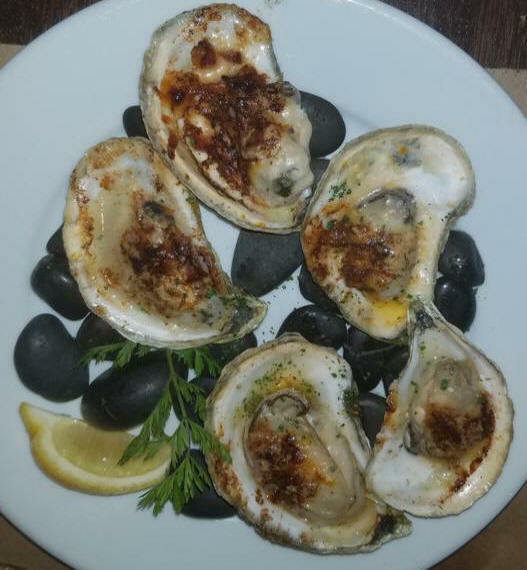 I never eat oysters (or any raw seafood) unless it is thoroughly cooked so it was a rare pleasure for me to enjoy five baked oysters as a starter (below left). 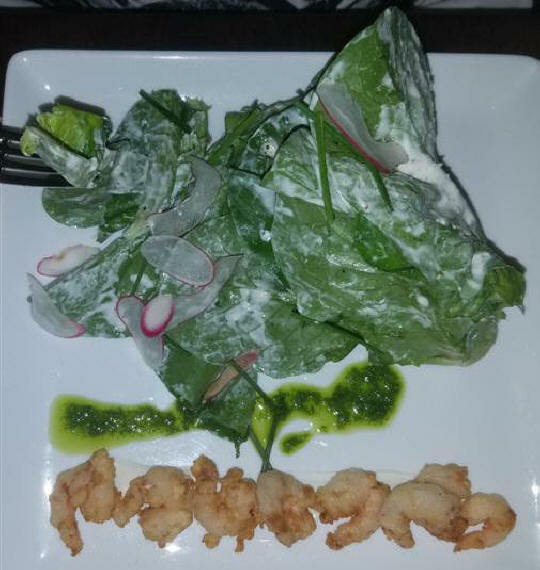 Marcia had some shrimp salad (below right). 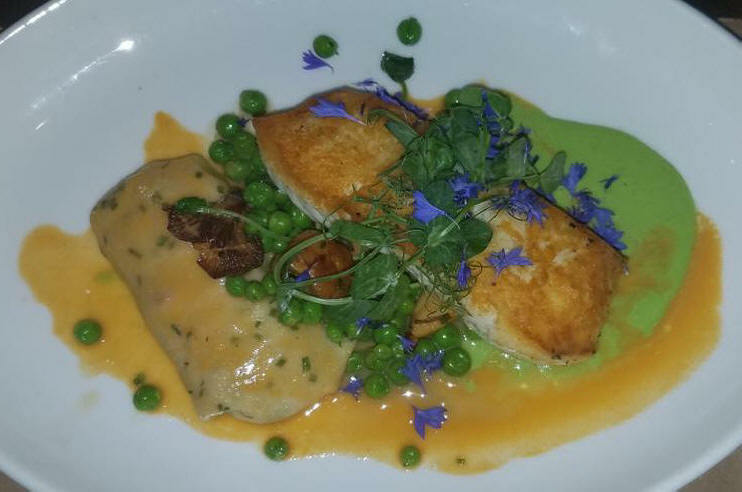 For an entree, I had pork saltimbocca on mashed potatoes with potato gratin (below left) and Marcia had halibut (below right). 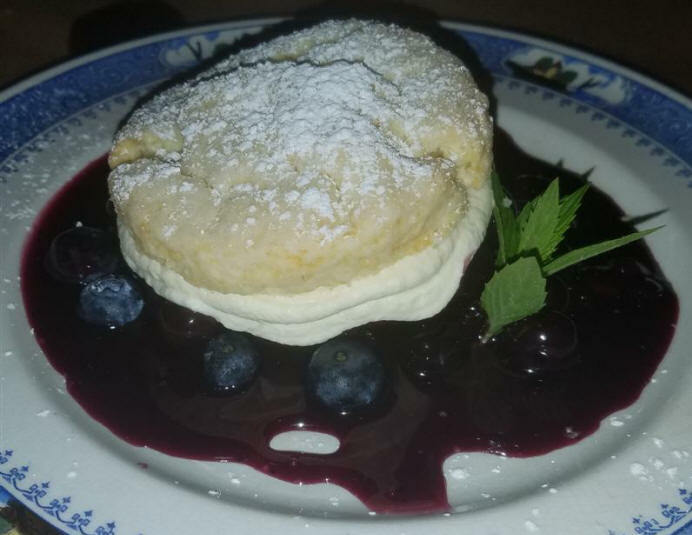 For dessert Marcia had a glass of lemoncello with an apple tart (below left) and I enjoyed this version of a blueberry shortcake (below right). The whole meal came to $207, which is a little stiff. We left there at 10:30 and since we never have the opportunity to shop in a WalMart and they stay open late, we drove over there and arrived at 10:45 PM. We bought a USB plug, Tile Mate (to find lost items), an S7 phone stand, books, bags, and a luggage scale which all came to $86.74. We left there at 11:55 PM and got back to the hotel and to bed at 1:30 AM. I woke at 11:30 AM and today we were bound to take a drive from Rockland to Camden. Below is the center of town and the pale yellow building (far right) is now called the Sea Dog Brewing Co. We drove down past it on the right. This get you to the main parking lot overlooking Camden harbor. 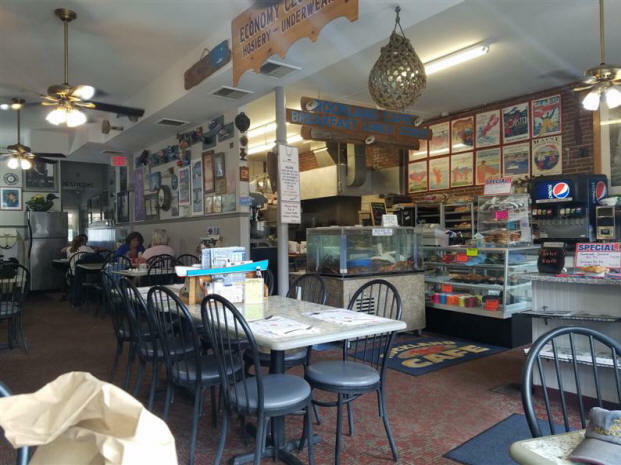 I was dressed to do my run which I started at 2:40 PM and when I was finished I stopped into the Zoot Coffee house [31 Elm St, 207-236-9858] because the one I usually like to go to had already closed. It was pretty nice and I enjoyed a decent cappuccino (for $4.75) while working on my computer. Marcia had been traipsing around town doing some shopping but we all had to meet Carl and Linda (Marcia's high school friends) at the Salty Dog in the center of town. 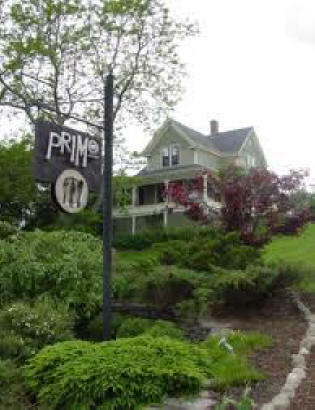 I had two 3.2 beers at 5:30 PM and then at 8:15 PM, Carl drove us to a new place he wanted us to try called Rhumb Line [59 Sea St, 207-230-8495] which is on the other side of the harbor and only open in the Summer season. The first thing I saw was this big bath tub filled with live lobsters - it couldn't be too bad. Their outside patio was pretty crowded so we got a table inside. 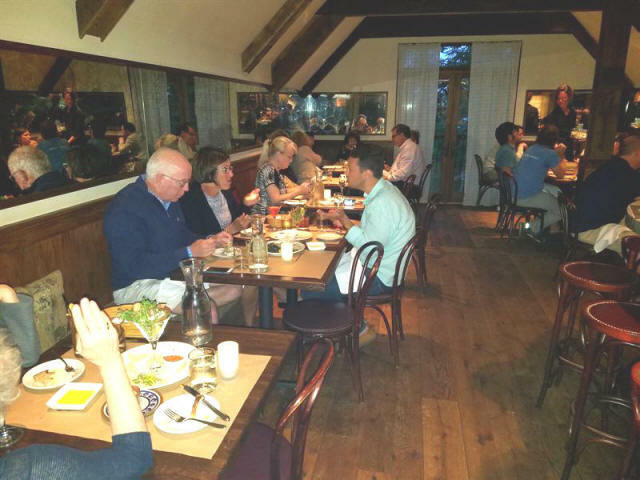 Marcia (center) is sitting next to Carl with Linda across from him (below right). 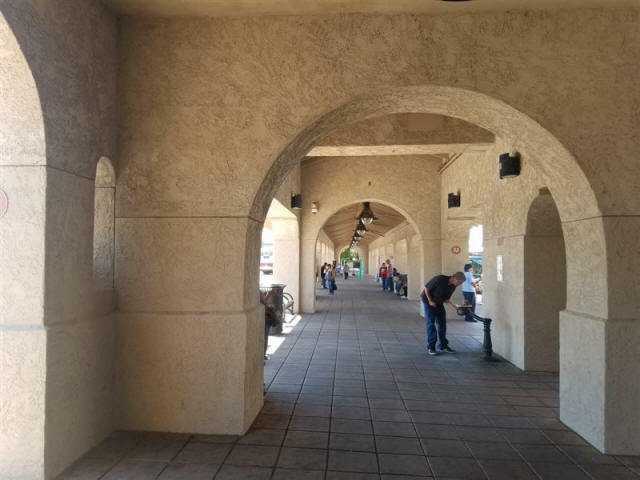 While waiting for my order, I went and took a few pictures of the inside (left) and the patio (right). From the patio, I got these shots of the harbor with the sun having just set. Camden is on the other side. 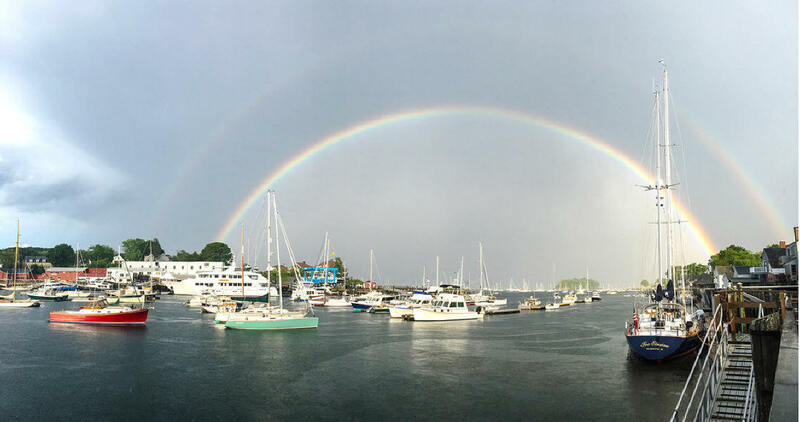 And here is a stock photo of a nice rainbow over the harbor. I started with a can of Guinness and then had sautéed haddock with fries followed by a dinner of a steamed lobster with drawn butter. 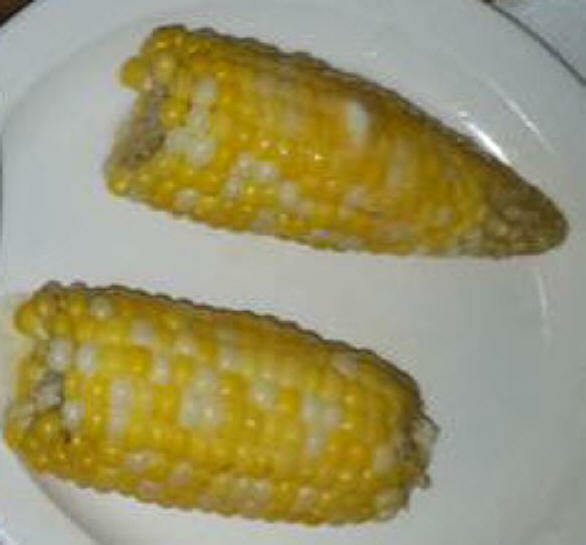 It came with an ear of corn which was good. 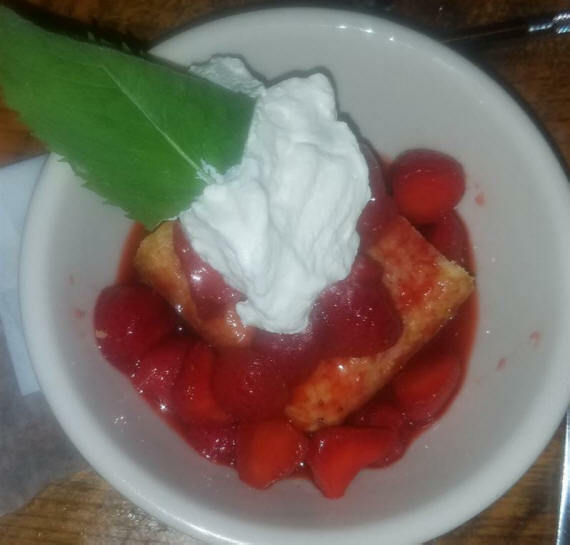 I followed that with a nice dessert of strawberry shortcake. Remember, I eat only ONE meal a day. Marcia had white wine and only a crab roll which I forgot to take a photo of. The dinner came to $128. It was excellent and it was fun getting to see them again. Carl drove us back to our car and we made the short trek back to Rockland and got to bed a little earlier at 11:30 PM since we have to leave in the morning. I woke up at 11:30 AM and got into my running gear, packed up, loaded the car and checked out of the hotel at 1:15 PM. 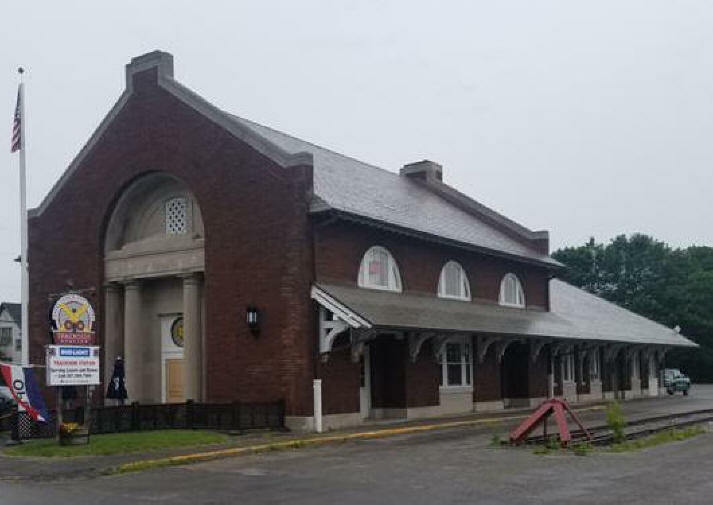 I went for my run through town at 2:40 PM and got this shot of the Strand Theater and the Farnsworth Museum (below left) and the old Rockland Rail Station (below right). At 3:15 PM, I had a cappuccino at Rock City and on my way back to the hotel, at 3:45 PM, I stopped at the Rockland Cafe [441 Main St., 207-596-7556] to get a lobster roll for me and a crab roll for Marcia to take on the trip. When I got back, at 4:15 PM, we then drove over to the house on 41 Talbott Ave that Marcia grew up in which is now owned by her nephew Matt Wasgatt. He was waiting for us to take our usual look at the old place where he now rents rooms out. 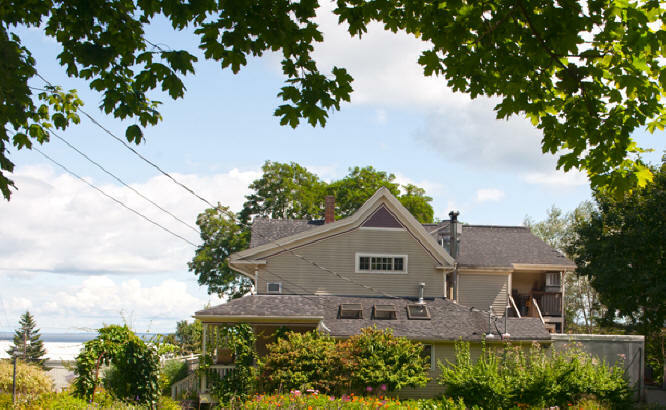 The area of the house on the right is where Dr. Wasgatt had his office to see patients. You could do that in the old days. 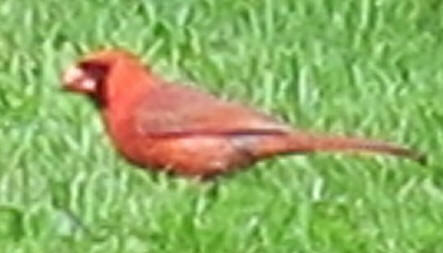 It's a little blurry because it was quite far away, but I got this rare shot of an actual cardinal pulling a worm out of the ground in the neighbor's lawn. 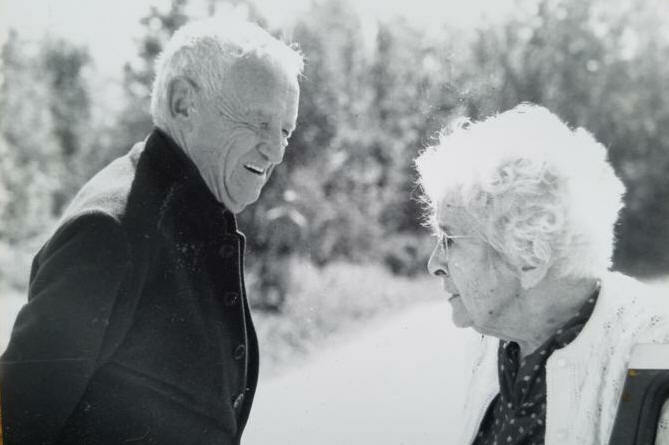 We had a nice visit with Matt and I took a shot of this photo in the house of Marcia's aunt Mary with the famous artist Andrew Wyeth (1917-2009) who put Rockland on the map with the Farnsworth Museum holding many of his works. Mary was a volunteer at the museum for many years. His website is quite nice to visit. There are many of his famous paintings there. 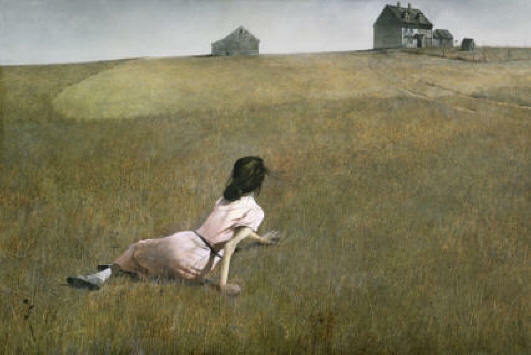 His most famous is his 1948 "Christina's World" (below left). 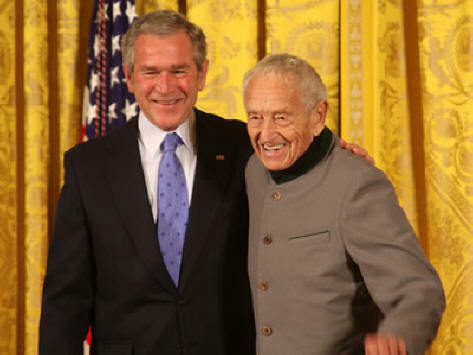 George W Bush awarded him the National Medal for the Arts in 2007 (right). At 5:10 PM, we finally left Rockland, got gas at Maritime just outside of town at 4:40 PM and I drove the first 99 miles south. On our route to Boston, when we reached Wiscasset, Maine, we passed the famous Red's Eats [41 Water St, 207-882-6128] where the sell these excellent lobster rolls. Instead of standing in that line (which is usually always long), we ate the ones I brought with us. At 7:00 PM, we made a pitstop at the Kennebunkport South Travel Plaza and I got a Starbucks cappuccino and an Auntie Anne's pretzel and Marcia bought some medications. They had a live lobster tank there as well. 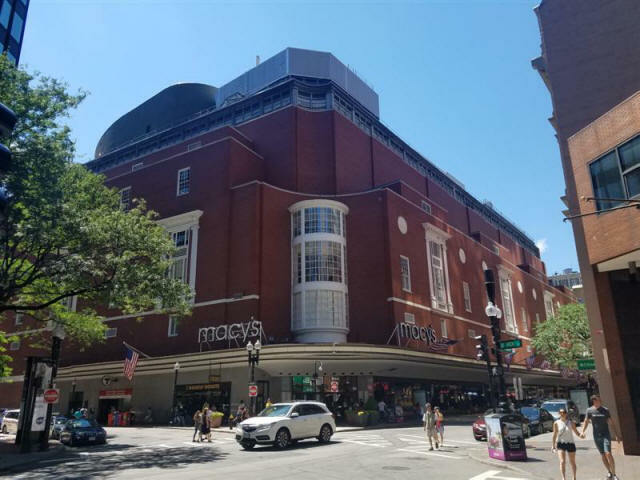 We took off at 7:30 PM and Marcia drove the remaining 86 miles to Boston's West End. 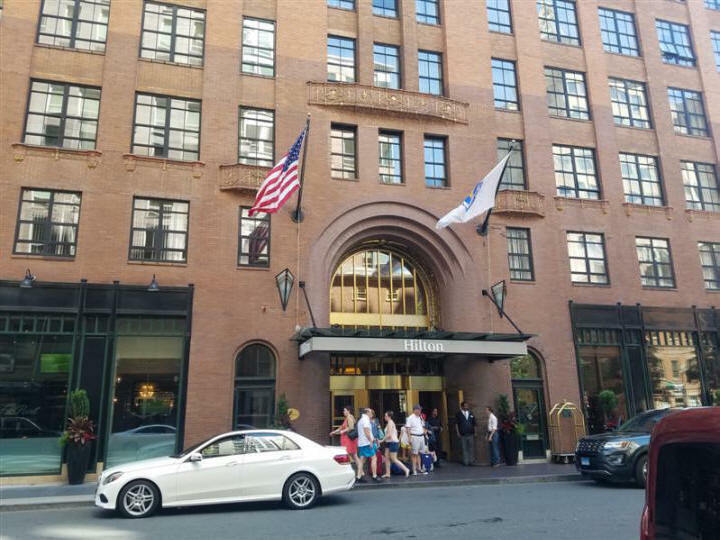 We arrived at 9:00 PM and the GPS took us straight to our hotel; a new one for us I got on Booking.com: the Wyndham Boston Beacon Hill Hotel (below) [5 Blossom St, 617-742-7630]. We checked in and they put us in room #1418. We got unpacked and it was time to head out to look for dinner. Their reception area could use a refurbishment. They are not in an area of Boston we know anything about. This was our view out our window. There were a lot of big hospitals nearby. 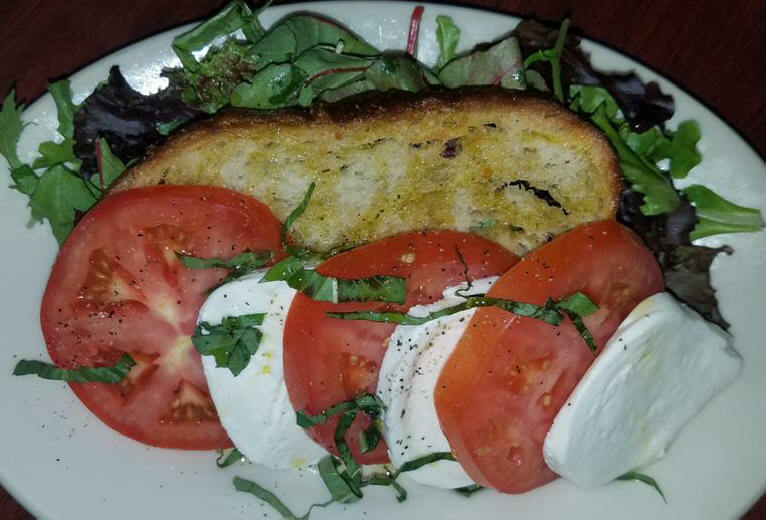 We took a walk along Cambridge Street and I was in the mood for Italian so we decided to have dinner at 9:30 PM at Antonio's Cucina Italiana (below) [286 Cambridge St, 617-367-3310] at the corner of Strong Place. Even though it was rather late, this was a Friday night and I should have gotten the hint when this place was completely empty. But, we got a table and ordered a bottle of my favorite, Orvieto Classico. 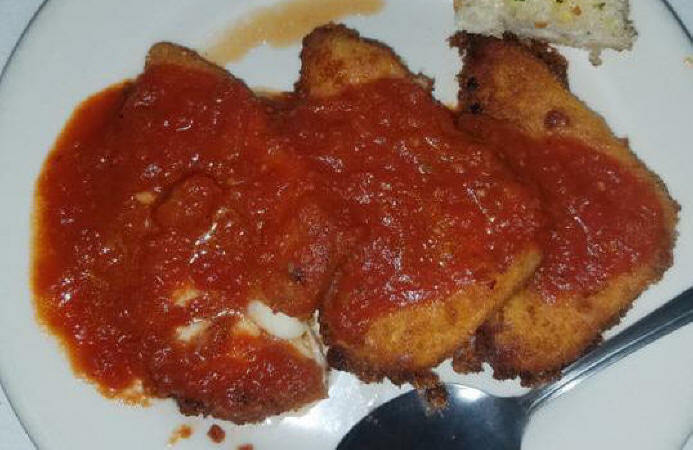 We started out by sharing an order of mozzarella marinara which wasn't bad, but not great. 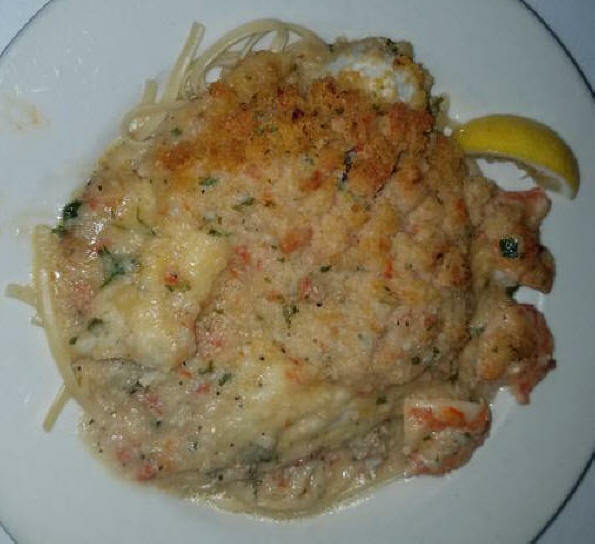 I then had an order of baked haddock with shrimp on linguini (left) and Marcia had veal piccatta on penne (below right). 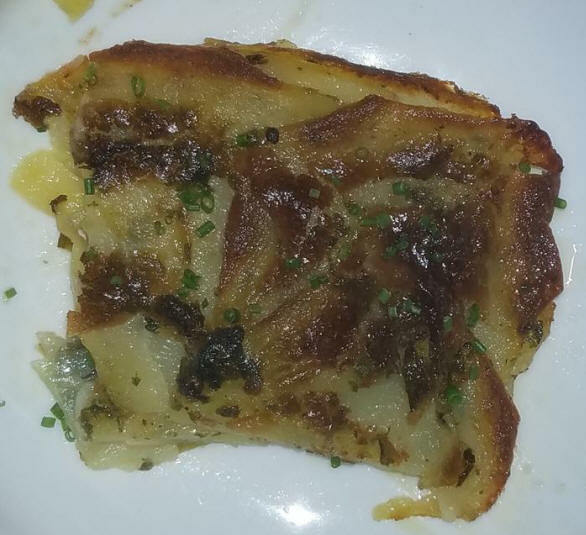 As you might surmise from the photos, neither was very good; the pasta was overcooked. We should have gone to the cute little French place we passed on the way here. We left there at 11:00 PM and walked back to the hotel and got to bed at midnight. Our second day in Boston didn't start too early after that drive yesterday. 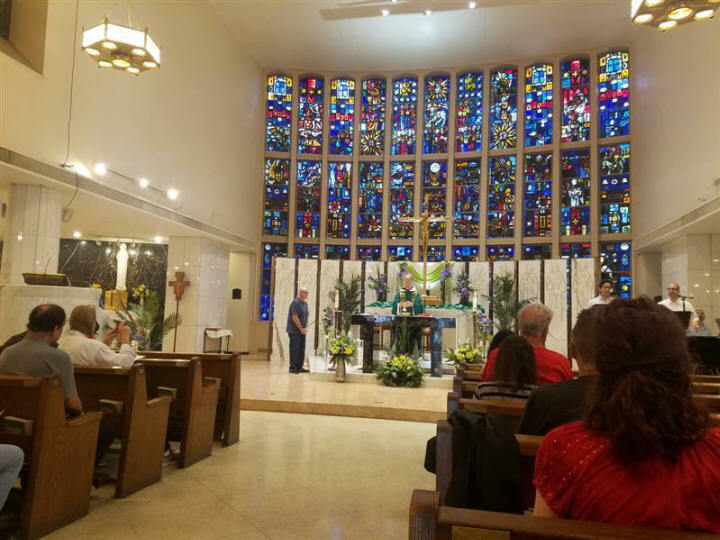 I Woke at 10:30 AM and again at 2:00 PM when I got up and decided to go to Mass today so that Sunday will be freed up to get to the airport. 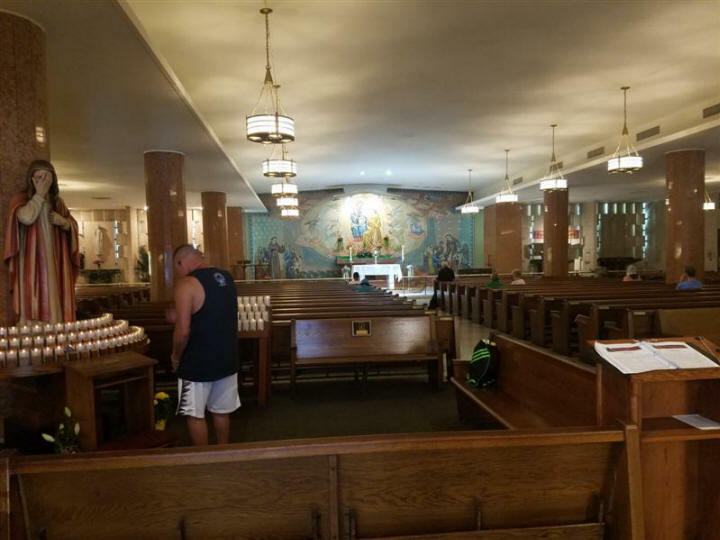 At 3:30 PM, I did my run to Arch Street and got to the 4:00 PM Mass at St. Anthony's Shrine as I did before, except this time the Mass was in the chapel on the first floor (below). I got a chance to talk to Fr. Tom Conlon OFM. He is a Franciscan priest and I was educated at Siena college by Franciscans. After Mass, I went to Café Nero again and had two cappuccinos for $8. I worked on my computer until I left at 7:30 PM and while walking back it really started to rain hard. So much so that I ran into a Primark store and bought an umbrella for $6.38. Even so, I was quite wet making the trek back to the hotel. I changed and we headed out for dinner on the same street, hoping to try out the French place that looked so nice last night. 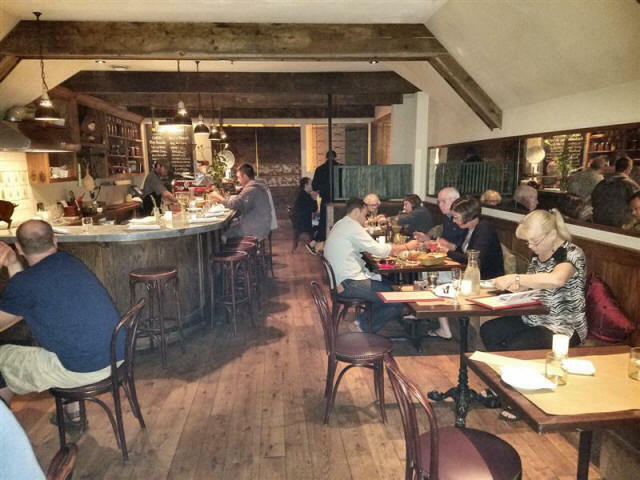 We arrived at 8:40 PM for dinner at Ma Maison [272 Cambridge St, 617-725-8855]. They gave us a very nice table and I ordered a 1664 beer and Marcia had a Dubonnet. 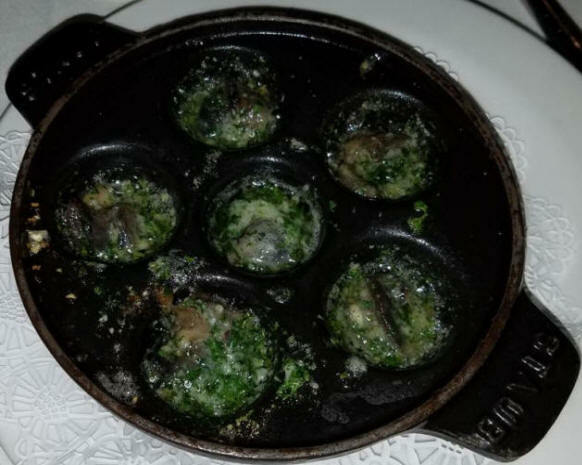 I ordered a bottle of Sauvignon Blanc for dinner and then had an order of beautifully done escargot (snails). 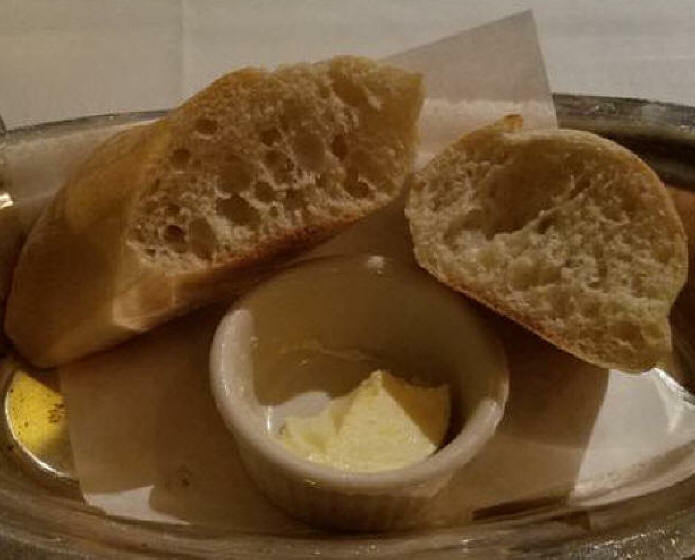 The fresh-baked French bread that came with it kept Marcia dunking it into my escargot garlic sauce; she won't touch the escargot but loves the sauce. 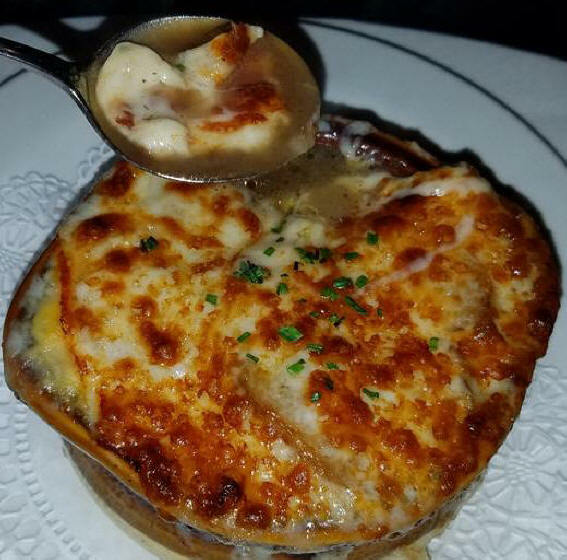 She had a beautiful French onion soup. 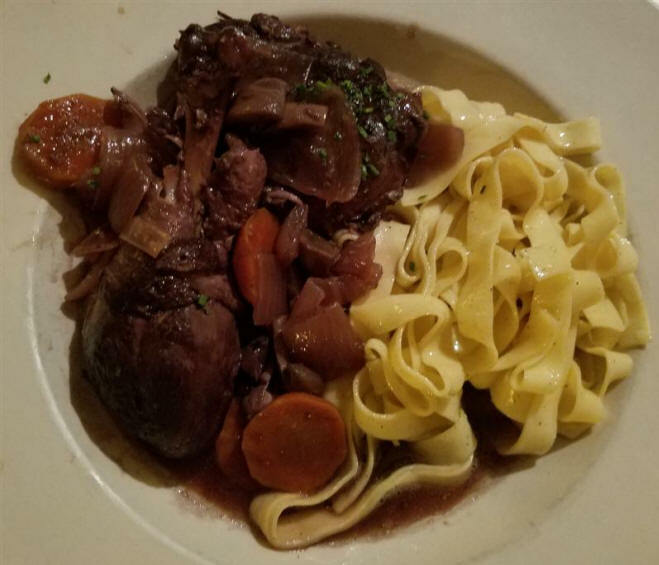 For my entree I had perfectly cooked calf's liver on mashed potatoes with onions and bacon while Marcia had Coq au vin (chicken cooked in red wine) which came with with tagliatelle pasta. Boy, were both of these meals good! 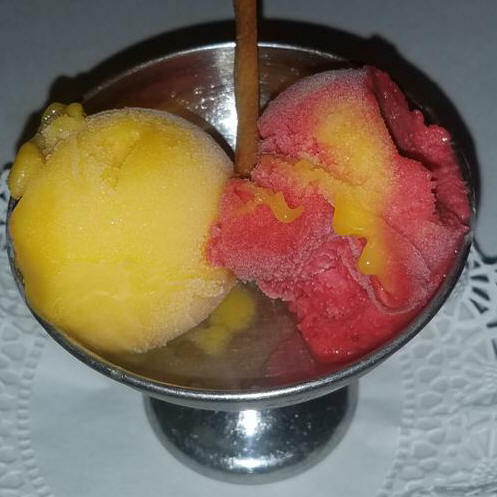 For dessert, we split an order of mango sorbet and raspberry sorbet. The whole meal came to $172, which is a little on the high side. We left there very happy at 10:30 PM. On our walk back, at 10:45 PM, we stopped into the Hill Tavern [228 Cambridge St, 617-742-6192] for a Guinness and white wine to get a feel of the local crowd here. While there, I confirmed our Lufthansa flight for tomorrow online with my S7 phone. I got these shots of the place the next day. We left there at 11:15 and walked to the hotel and got to bed at 12:30 AM. Today is flight day and our third day in Boston. I woke up at 12:00, 8:00 and at 1:15 AM and then got up and checked out of the hotel at 1:50 PM. I got a shot out the window and one of the breakfast room at the hotel. 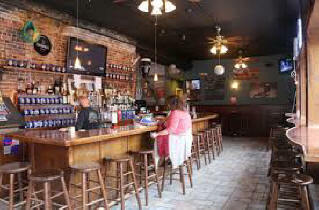 Below is their bar area which is open to the street. At 2:20 I stopped in Starbucks for a cappuccino (below left). 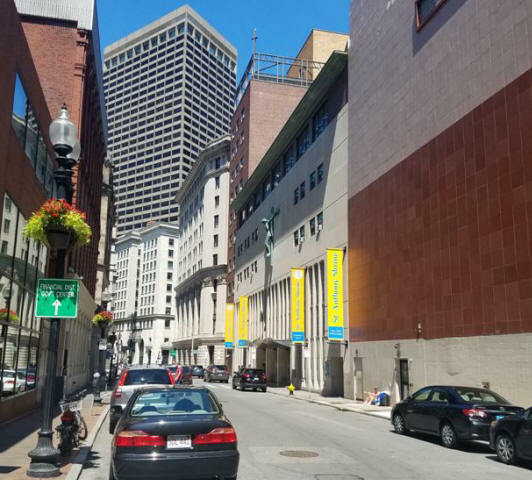 As you can see, the side streets lead up to Beacon Hill. 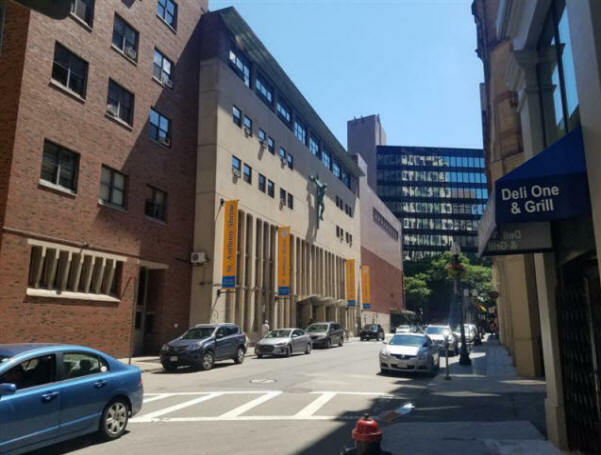 This is the neighborhood (below left) and on the right is the Paul S. Russell MD Museum of Medical History and Innovation [2 N Grove St, 617-724-8009]. 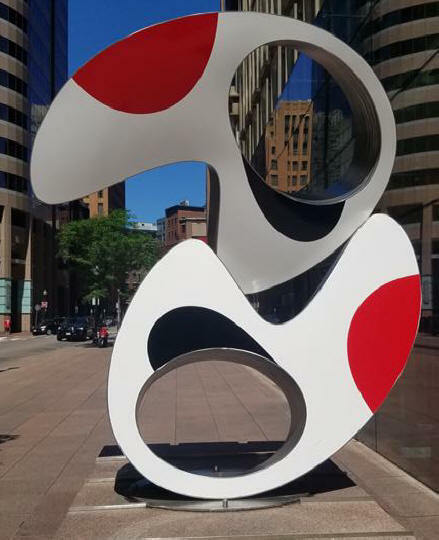 It is the museum of the Massachussets General Hospital. I got back to the hotel and at 4:45 PM, immediately went for my run on their treadmill and then the streets. After my run, we packed up and got the car and drove to Logan Airport and dropped the Budget rental car off at 6:00 PM. Lugging our bags, we caught the new bus that takes you to Terminal E (International). We got all our bags and went into the main Terminal. We waited in the check-in line and they took most of our bags except our take-ons. At 5:50 PM we were checking through customs and the TSA checkpoint. Once cleared, at 6:30 PM, we arrived at the Lufthansa Business Class lounge (below). As you can see Lufthansa has a pretty big luxurious First Class lounge. Since I don't drink alcohol when I'm flying, I passed on all the free beer and wine. At 6:30 PM, we had a make-shift early dinner in the lounge; I had a pastrami sandwich, a bowl of clam chowder and two cappuccinos. There is my Galaxy S7 Edge phone I used to take many of the photos. It has an app that allows me to scan all my credit card receipts making pdfs that I can easily send home so my secretary can check the credit card billings while we are gone. I then took my first 0.5mg Klonopin tablet. At 7:20 PM we checked in for the flight and soon boarded the plane (Airbus 350-900; Flight #LH425, Seats 4A/4C). Once seated and settled, at 8:20 PM, I took the other Klonopin 0.5 mg along with eight 3 mg Melatonin tablets. I put my earplugs in, my blindfold on and put my blow-up neck-pillow on. At 8:45 PM the plane took off and by 9:00 PM, I fell soundly to sleep. The flight is supposed to take 7 hours and 25 minutes and fly 3,854 miles. 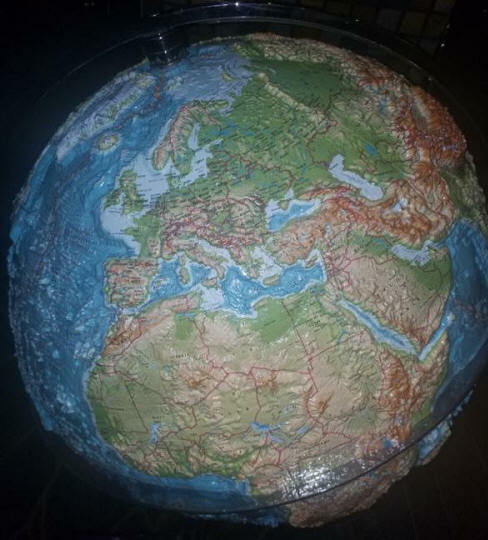 We lose 6 hours crossing the Atlantic [CET means Central European Time]. The Canon camera captured the entire cabin of the plane. The seat in front of me housed the display of the flight statistics. Marcia woke me at 10:40 PM and asked me if I wanted any dinner. So I tried what they were serving. 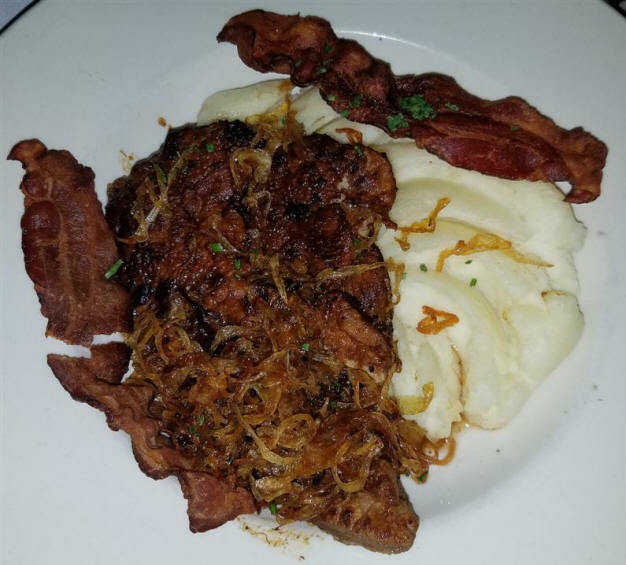 It was some kind of meat with mashed potatoes and green beans. It was followed by various cheeses and dried apricot. I tasted a little bit of all of it and then quickly fell back to sleep. Tomorrow we will be in Munich. Please Leave Me a Message by clicking the spinning @ sign below.